Greeting folks. 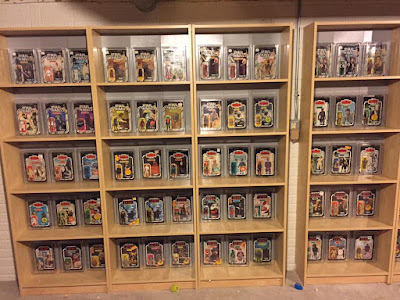 It’s been a long time coming, but I’m finally getting back in the swing of things with our collector limelights and have several discussions underway with a slew of great collectors in the hobby. This month we head back to focusing on a focus collector. Thus far we’ve had a few interviews with focus collectors and they’re always fun to review. Not only do you get to see one of a kind items that usually only end up in the hands of someone with a limited scope, but you also get to dive right into a lot of pointed questions about the character and the collector that are more difficult to get into when you’re covering a broader set of items. The collector I’ve chosen to focus on for this update is Ross Barr. Ross has been collecting for several years, but in comparison to others I’ve interviewed to date he’s still a rookie. Starting to collect a few years back, Ross has expanded and contracted his collection and today has a more refined collection that focuses in on a smaller segment of items, and particularly one character: Han Solo. I’ve known Ross for a short while, however during that time he’s grown to be one of my closest compadres in the collecting community. He’s a very personable individual who has a vast network in the hobby. Ross gives the hobby itself a lot of attention and a great deal of his personal time outside of just collecting. In addition to being involved in the vast interpersonal aspects of the hobby from conventions and general networking, he is also involved in the day-to-day management of the hobby serving as an admin for four separate collecting groups on Facebook: the 12 Back Collectors Group, the Empire Strikes Back Collectors Group, the Return of the Jedi Collector Group, and the "Dark Times" Collectors Group. Being an admin can be a daunting task giving how quickly these sites are growing both in relevance and overall membership. Ross is one of the few that I’ve met over the years that truly seems to have a focus on keeping things fair and organized vs. having an ego over his position on these boards. Thus, it’s always great to get to catch up with him and hear more on his adventures in collecting and perspectives in the hobby. 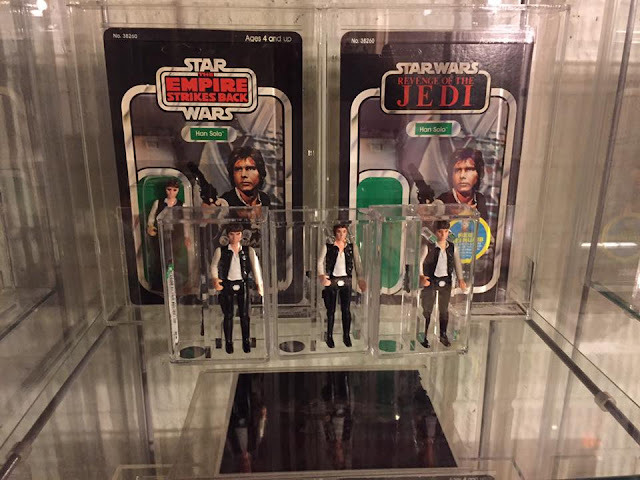 Although Ross is a Han focus collector, he goes beyond that with his collection boasting a full range of figures, prototypes, and store displays that are enough to make any collector new or old take notice. As we started to chat we discussed the same place that most collectors start to collect, the beginning. RB: I’ve only in the hobby the last three years in my current capacity, I started on Rebelscum in 2013. However I’ve always been a collector. I had my childhood figures and never got rid of them. Between the age of 25 and 32 I picked up a few figures [he was in law school prior to that] as when I moved from New York to Ohio I found my childhood collection. About a year later I started collecting more intently. FP: How did you come up with your focus? RB: It started to come together as I was really getting into collecting. I always liked Han Solo, his redemption story (overcoming selfishness) and the message that goes along with that, given that there was always a connection to that character growing up. 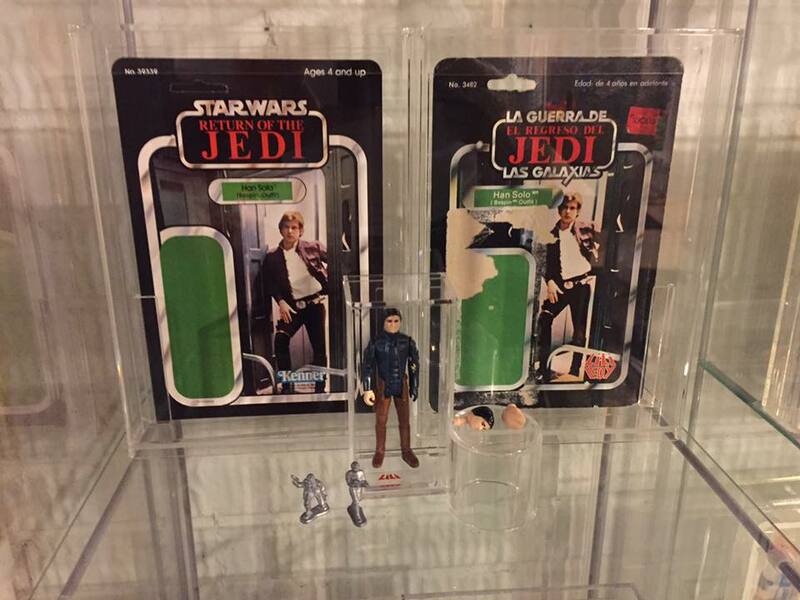 I had a few Han pieces in my collection at that point -- an ESB 31 back with a small head being the key one. As I looked at other focus collections, no one really had a Han Solo focus, so I went for it. 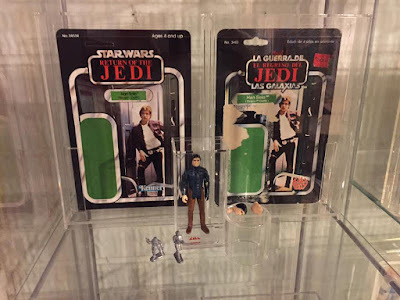 The collection encompasses a lot of different items but at the core it’s a carded Han Solo (Original) focus, but when it comes to pre-production, it’s anything Han related. FP: In addition to the Han focus, what else is in your collection? RB: When I started to collect again I had the seed of an idea to obtain all 92 characters on their debut cards. 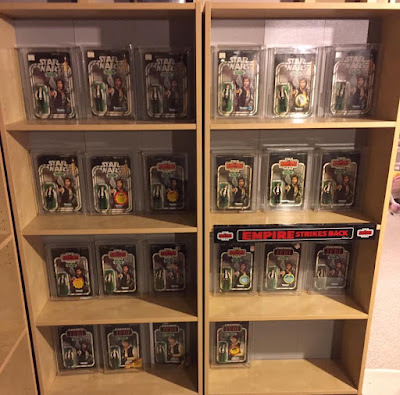 I got pretty close to this, but decided a while back to stop the expansion and got rid of my POTF collection, and added more focus to the Han Solo collection. 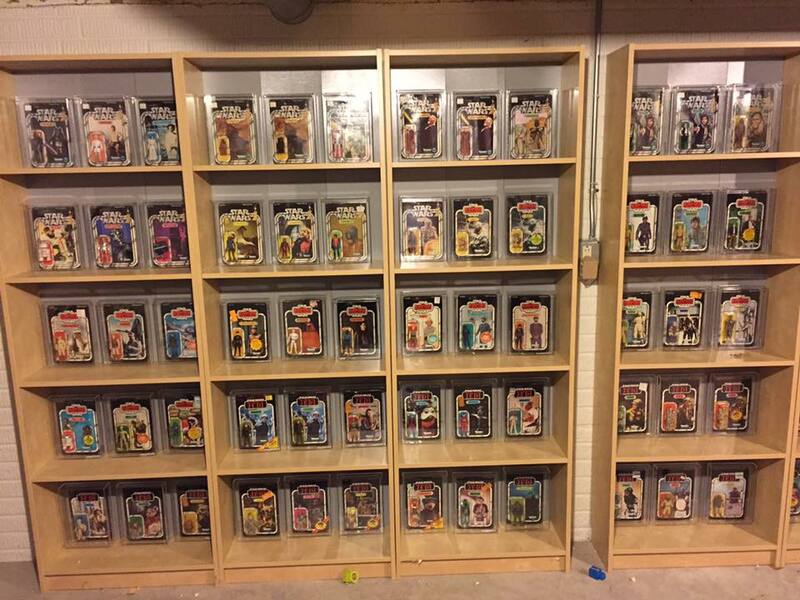 I still have the original 79 with a few variants, including cloth and vinyl Jawa, and Bespin Luke and Leia alternative artwork. Then there’s the vehicles and playsets crossing all three movies, Jedi, ESB and Star Wars. The original Star Wars was what really appealed to me and is where I’ve put some energy one of my favorite items is the Luke Radio Headset. I have a lot of the Star Wars displays, including the Collect All 12 and 21 bells, Fett header as well as the Han and Luke Laser Pistol headers. RB: In the Han collection it’s the Han Trench Coat Sample on the Emperor’s Royal Guard cardback with Han wearing a non-production jacket. I had to make a massive trade to pick it up, but it’s truly the centerpiece of the collection. RB: In addition to that there’s several key pieces both Han related and in general. The first one that comes to mind is the long Boba Fett header display which I just sent in to get graded (one of the few things I’ve sent in over the years). It came from a find that I was working on for a while it’s a great piece. I have a run of the three double telescoping saber figures which are key items for me personally. Included in that run I have a first shot Obi-Wan Kenobi with mushroom tip saber (one of the first figures produced). Then I have a set of the sabers themselves including 4 full DT sabers and 3 halfs, with three different prototype sabers: Ben engineering pilot, Vader (circle), Vader (pre-production) and Luke engineering pilot. 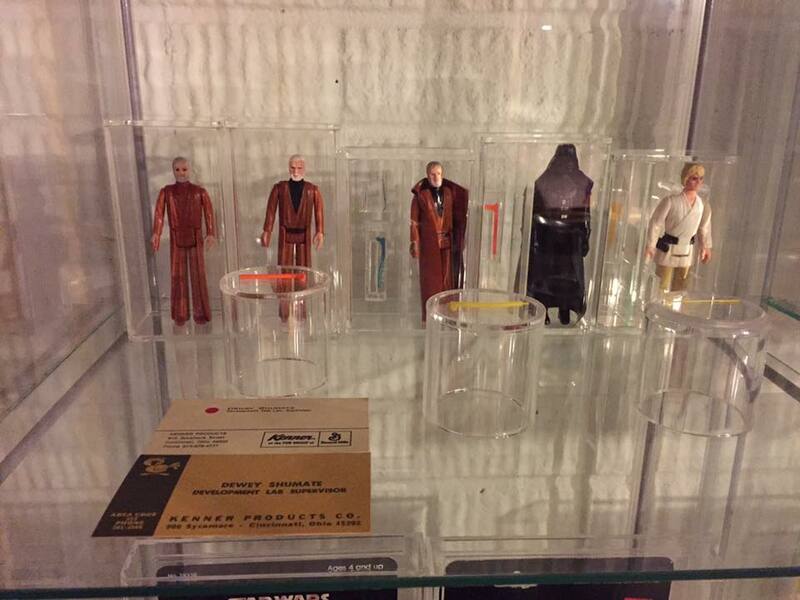 RB: I have the unproduced POTF proof for Han Hoth -- a tough piece to find. On the opposite side of the time spectrum I also have the first shot for Han Hoth. RB: Staying on the topic of pre-production, there are a few other key common proofs that I’ve picked up over the years: ROTJ Han Trench Coat 79, ROTJ Han Bespin 65 and Han Original Revenge. FP: Has your focused evolved over your collecting life? RB: I went from buying a lot of stuff, this and that...it was a bit unorganized for a while. It was getting cluttered, so I got rid of the POTF stuff I had and focused on the early stuff (got rid of Anakin and Yak Face), they really worried me due to the fragileness of the figures. Started to focus on early stuff and from there I started to get more focused on Han. I keep focused on the older stuff as well including the displays. My tastes changed and things evolved over time. FP: How do you give back to the collecting community? RB: The primary thing I do is being admin to three of the Facebook groups [now four including the "Dark Times"]: The 12 Back, ESB and ROTJ pages. The groups have been around for over a year now. I have an added appreciation for the admins on Rebelscum. It was really cool to see how much of a community RS created, and it’s how you and I got our starts in the hobby. People are a little less respectful of the admins on Facebook than the mods on RS, as the mods are truly the gateway to you being part of the site or not. FP: How do you keep your collection fresh? RB: For better or worse I’ve always had a bit of an addictive personality. It’s about time and energy and when I moved to OH I had more time to do things and that’s where it took off. Sometimes it’s not about keeping it fresh, it’s about keeping myself away from it. I’ve been really active over the last three years. It’s a lot of keeping up with the community, Facebook, RS and eBay. Friends are a key part of it. A lot of them have gotten out of the hobby, but there are a lot of people that have become good friends through the hobby. RB: I serve on three non-profit boards. I have three kids: 4, 6 and 2. I’m really into Cleveland sports good or bad... the Browns, Cavaliers and Indians. I love concerts, and I’ve been to nearly 90 Phish shows over the years. FP: Does your collection spill over into any other collectibles? RB: Not too much. A little He-Man, GI Joe, but it’s because I had the room at one point. Since then I’ve dropped those lines. I have been working on MASK -- I have a few transparencies, and 10 MOC figures. FP: What does your significant other think of your collection? RB: She’s not into it. She doesn’t collect with me or do the shows, but she really appreciates that it’s important to me. She’s happy for me, and enjoys that it makes me happy. Focus collecting is an act of patience. For many it takes years to amass their collection to the set of items they are interested in. It may takes years to find a single item and several people will go for more than a year between finding anything new to add to their collection. Over time, these focii evolve in some cases based on needs and wants, in other cases based on what becomes available to them. In the end it’s truly an act of loyalty and dedication to pull together an expansive focus collection, especially when it comes to a character like Han. I want to thank Ross for opening up his home and time to me to discuss a great collection, and the great story of how it came together. 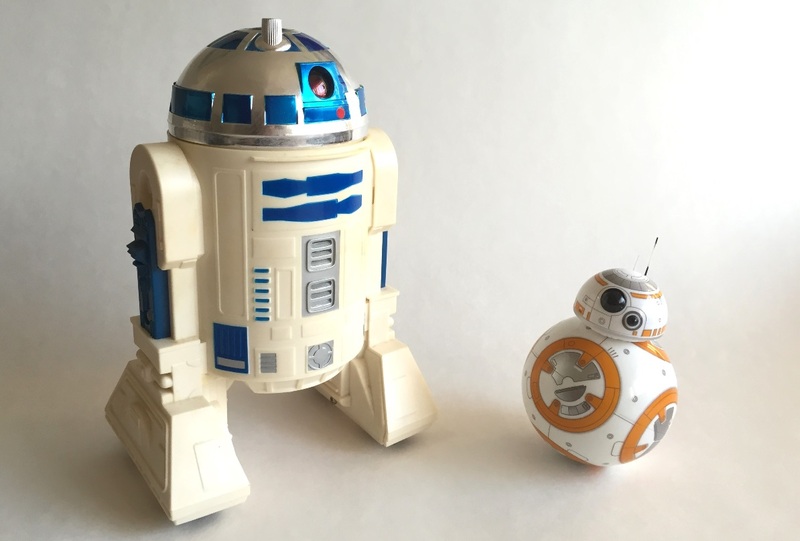 R2-D2 and BB-8 -- is the Star Wars galaxy (and toy aisle) of today big enough for the two of them? The parallels of over three decades of technological advances between the fictional universe the two characters inhabit and their debuts as interactive toys provide a curious historical perspective for collectors interested in that sort of thing. Aside from Darth Vader, there may not be another Star Wars character as "toyetic" or consumer product-compliant as Artoo. Just ask any R2-D2 focus collector or run a "R2-D2" keyword search on the Archive Database. Though certain vintage era concepts (such as these clocks, tape deck, and "Soapy R2-D2") sadly never came to fruition, Kenner was destined to produce a radio controlled toy based on the lovable wheel-propelled trashcan. It was an absolute no-brainer. What Star Wars-crazed youth wouldn't clamor for his own personal droid counterpart that they could roll around the house? As a logical step above a stationary 3.75" or 12" scale action figure it would be surefire top seller... in theory. 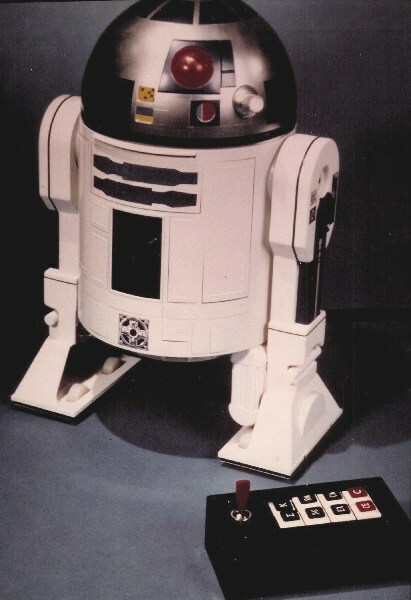 A photograph of an early mock-up incarnation of the toy (pictured to the right) depicts another vintage era example of the ingenious use of a calculator to depict state of the art technology. "[It] had an 8-track tape player . . . which played a recorded audio track. With the help of a sound activated switch and a Cadillac window motor, the head would turn back and forth and the light would flash in sync with the audio." Though the final product ended up being smaller and simpler, there was quite a bit of excitement over the toy upon its release and Kenner was obviously proud of it. 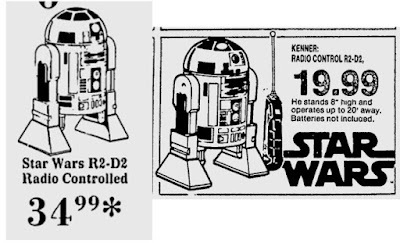 Contemporary accounts of the '78 Toy Fair all make mention of the Radio Controlled R2-D2, singling it out as a hot new toy. To reporters, it represented a technological achievement, if not a total realization of the promise of the films. They could at last see and interact with R2-D2, exactly like his film counterpart, controlling his actions and sharing his adventures. Star Wars had spread space toys and images of the future across all manner of consumer products that winter, and to attendees, it must have seemed like the future itself had arrived. Industry professionals (very accurately) predicted that it represented a shift in the marketplace. The birth of consumer electronics, targeting not just children but the entire family, meant more expensive toys and gadgets, and a greater variety of them. Or as the president of Coleco put it at that Toy Fair: "electronic everything you can possibly think of will be big in the years to come." Given the amount of new technology seen that Christmas, his prediction seemed to be coming true. The Radio Controlled R2-D2 was one of the first such gadgets to enter this changing marketplace. It had a suggested retail price of $25.99, but retailed for as much as $34.99 that Christmas, as retailers looked to cash in on the Star Wars name. To put that into context, that was as much as the Millennium Falcon vehicle Kenner had created for its action figures. 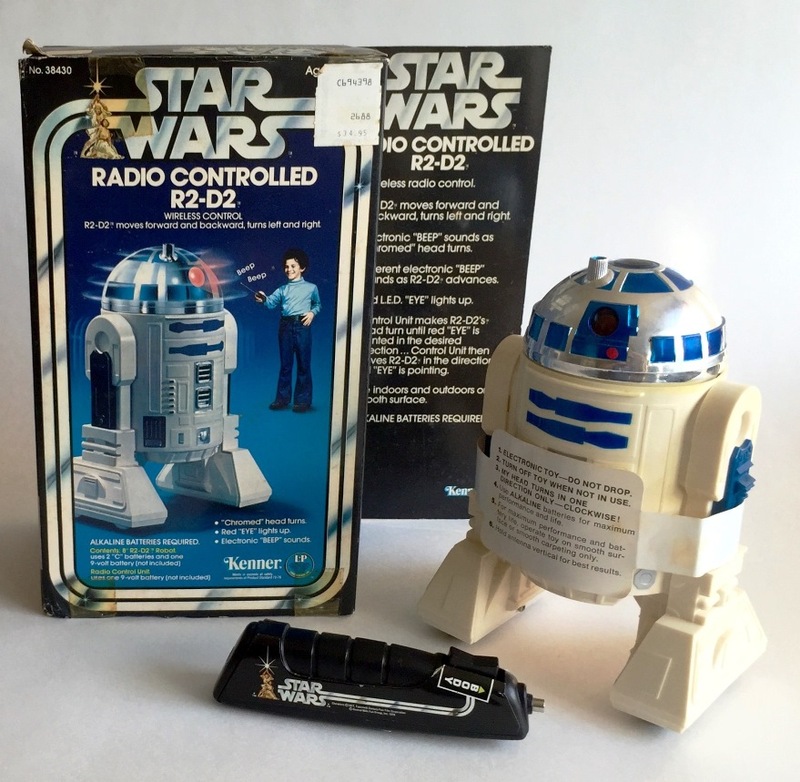 Unlike the Falcon, however, the Radio Controlled R2 could not be used with any of Kenner's other toys. It existed as a stand-alone novelty, with a high price point. Retailers and the public were thus cautious, despite the technological achievement the toy represented. This wasn't Christmas of 1977, when anything with the Star Wars name on it would sell. This was over a full year after the movie had been released. Kenner had already fulfilled their controversial Early Bird Certificates -- a promotion which had shocked everyone with its brashness -- and reporters all felt the need to speculate on the staying power of the brand itself. Even Kenner themselves seems to take the defense at times, as if needing to convince people that the public still wanted the toys which they were obviously still buying as fast as the company could produce them. 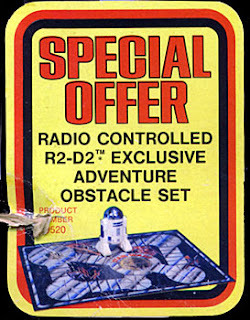 More than that though, by this point in time, there are plenty of Star Wars products to choose from and the Radio Controlled R2 was not the only thing they could spent their money on. Aside from helping to usher in a new era of toys, there didn't seem to be a whole lot going for the toy. To make things worse, the future did not come cheaply. 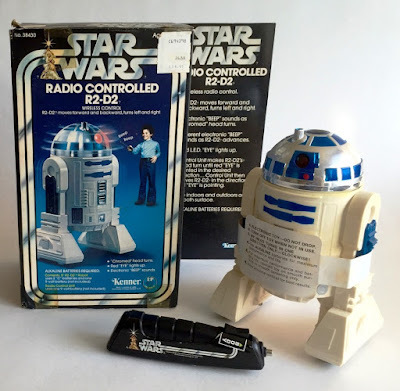 There was a hostility to some of the articles about toys that holiday season and the high price point of the Radio Controlled R2 didn't win it any friends. The average American spent just $88 per child on Christmas in 1977, so a $34.99 price tag was a significant amount, especially for merchandise from a movie which was over a year and a half old at that point. Analysts predicted that Christmas 1978 would see that number rise to almost $100 a child, which seemed like an astonishing amount at the time. Despite that, Kenner was still essentially asking parents to spend 30%-50% of their entire Christmas budget per child on one toy, which wasn't even compatible with any other Star Wars toys the child might already own. What exactly made this toy so special? Not pictured is the wiry antenna which connects to the remote. The "BEEP" sound can't really be described as a beep, but more of a discordant electronic screech that must have driven parents (and household pets) absolutely mad. This reality makes the various personal "beep" greetings incorporated into the instructions all the more amusing. With the instructions written from the perspective of R2, each aspect or "step" begins with a literal transcription of astromech-speak (from "Beep-boop-creleek" to "Boop-breeda-beep"). They certainly don't make instruction sheets like they used to, which is a shame. Another detail of note is a memo regarding CB interference: "If your R2-D2(TM) works normally but from time to time does not respond properly, you are probably picking up CB interference." It makes one wonder if that may have been the root of the problem with his "sensors" on Hoth. The tenuous toy's limited mobility and temperamental electronics are clearly stated on the box, instruction sheet, and on a paper sleeve wrapped around R2 himself. There is even a red-lettered "DO NOT DROP" warning label adorning the droid's undercarriage. An additional insert contains a peculiar note describing R2 occasionally succumbing to a "sleep" position wherein body movements are disabled and remedied by a slight turn of the robot's head. All of these precautionary details speak to the reality that this toy was wrought with issues. As mentioned in this earlier post from Ron, loads of them were returned to Kenner for mechanical repairs, apparently to the point that pallets of them remained in the employee store long past the initial release date. The product's 180 day warranty protected consumers against "original factory defects in material and workmanship." It also provided unsatisfied customers factory repairs for out-of-warranty or receipt-less items "for a reasonable service fee." In an ostensible attempt to entice retailers to take some of the aforementioned overstock off of their hands, Kenner offered the Radio Controlled R2-D2 with an "Exclusive Adventure Obstacle Set," which was essentially a mat with a gameboard-like map on which R2 would hypothetically navigate (or in reality, likely meander aimlessly). It's doubtful one could get much adventure out of this thing. However, the fact that simple flat ground was literally an obstacle for the toy lends a surprising degree of accuracy to the description. As mentioned in the database entry, it's unclear whether or not the mat involved some sort of game, but the graphics indicate the possibility of an objective. 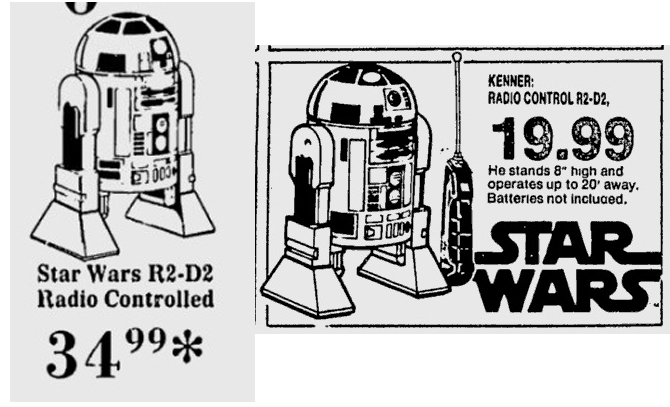 Interestingly, very few of these Special Offer RC R2s have surfaced, making it one of the scarcest of the already uncommon "Special Offer" toys from the original line. At Toy Fair 1978, a reporter had asked Kenner spokesman Jim Block about the staying power of the brand. The Star Wars "fad" had already gone on for over a year and few thought it could possibly continue for much longer. Kenner had finally filled all of their Early Bird Certificate orders, and the thought at the time among industry people seemed to be that Kenner's good fortune couldn't continue. Sooner or later, the public would tire of the upstart space film and return to more traditional brands. As such, Block was asked to explain why consumers should spend their money on his company's products, including the Radio Controlled R2 and its high price. What made Star Wars so special? "It's forever," the Kenner spokesman responded. "Star Wars is forever." Flash forward roughly 37 years and Block's reply is oddly prophetic. With the seventh film installment about to hit theaters and a myriad of new merchandise occupying toy aisles months in advance, the franchise is entering a second renaissance and its toys have as big a presence as ever. Only, R2-D2 isn't the only endearing dome-headed droid on the block anymore. Enter BB-8, the creamsicle-colored, spherical astromech that seemingly won over the hearts of the world the moment he first appeared onscreen in the first teaser trailer for The Force Awakens. While Target's Exclusive Remote Control BB-8 would admittedly be a fairer comparison given its targeted audience and price point, the toy that offers a much more compelling story is one developed and designed by the Boulder, Colorado based robot toymaker whose website assuredly claims that "One day every home will have a robot. It will be part companion and part helper. That robot will be built by Sphero." "Over the years, the magic of Star Wars™ has always lived on screen and in our imaginations. Thanks to our advancements in technology, we’ve made it possible to bring a new part of Star Wars: The Force Awakens™ into your home. It’s now possible to explore the galaxy with your own trusty Astromech Droid by your side. BB-8 is more than a toy - it’s your companion." Much like the character onscreen, Sphero's toy version was an instant sensation and has been accompanied by slick marketing that demonstrates just how much things have changed since the late 70s. 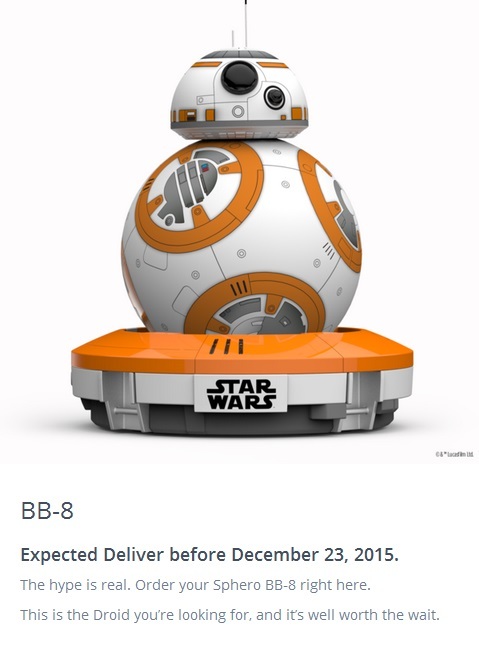 Initial demand was extraordinary -- the toy sold out almost immediately upon its availability online (reportedly 13 minutes in on Amazon.com and by mid-morning on "Force Friday" from the Disney Store, Best Buy, and Sphero's own online store). Stock at retail stores dissipated with similar rapidity. Sphero evidently sold 100,000 units in a single day, and as of this writing is still awaiting new stock to fill orders. They had better hope to have those units shipping out in time for Christmas or there'll be hell to pay. The character and toy are inseparably intertwined with the notion of state-of-the-art gadgetry. Gone are the days of simple pleasures (and strictly clockwise head turns). In addition to the artsy promotional photographs and videos, the product's modern flavor is clearly manifested in its packaging. "THE GALACTIC STANDARD OF DROID EXCELLENCE." At first glance, this could be seen as a rather bold claim and easily dismissed. It also has a tone more akin to a luxury car or Dyson vacuum cleaner advertisement. However, in the scheme of droid toys it is quite appropriate. Those earlier industry professionals harping on the longevity of consumer electronics at their outset were absolutely right. 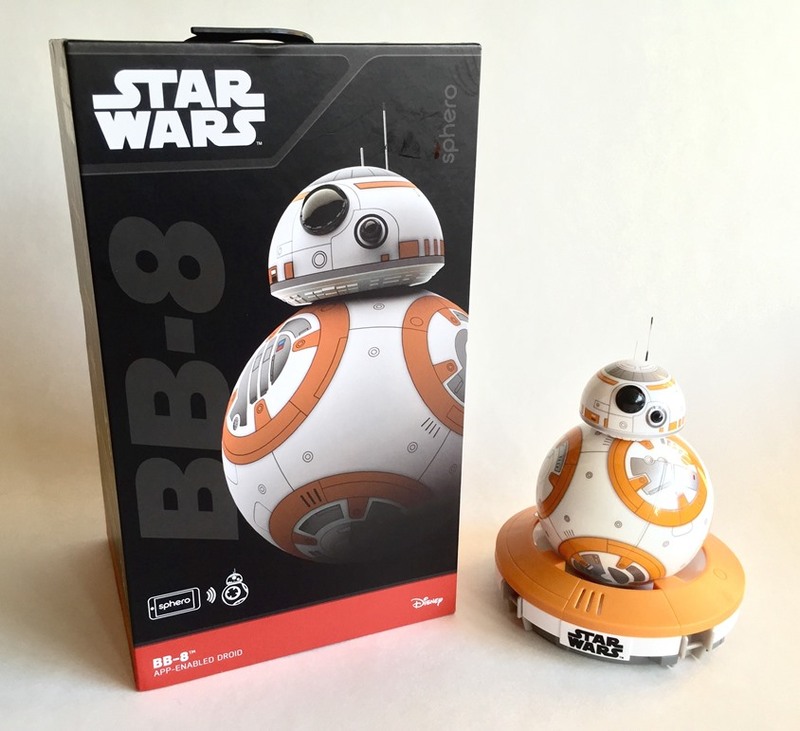 Sphero's BB-8 has set a precedent for exceedingly high expectations and more or less redefined the interactive Star Wars toy -- it's just as, if not more appealing to parents as it is to their children. Yet, its awesomeness can only be fully appreciated by remembering its humble Kenner predecessor whose semi-lameness only increases its charm as time passes. Thanks to Ron Salvatore and Chris Georgoulias for the photograph and additional information on the larger R2-D2 prototypes. It’s the last ‘Chive Cast before Episode 7 and the official beginning of the Postquel era! Steve and Skye briefly discuss the new movie, which somehow becomes a discussion on race and sexuality in the Star Wars universe. Then we invite many people to the Space Chess Roundtable to discuss the topic of Ethics in the vintage Star Wars collecting hobby. “Hey” Ross Cuddie from Canada, Derek and Greg from Singapore and Ross Barr from the back of his van join us to discuss promises; sheet cutting; box folding; flipping of all sorts and buying stolen toys. Plus, we invent the terms “Faux-cus collector” and we name the “Tillman Sculptor” during our discussion of the Black Bespin Guard. 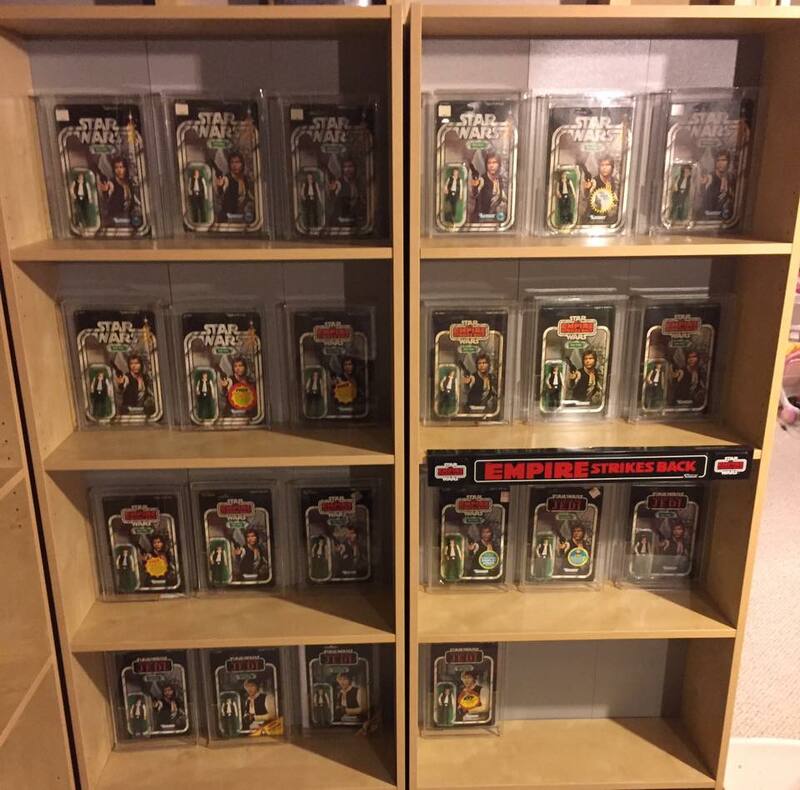 Join the conversation with the (Episode Order) 66th Star Wars Collectors Archive Podcast! 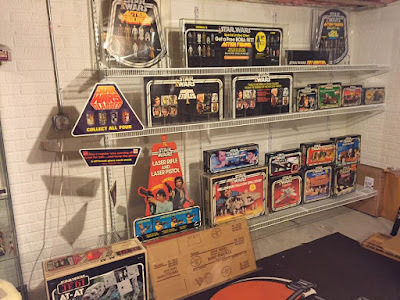 There are few elements of popular culture created in the last fifty years that are as iconic as the line of Star Wars action figures released by Kenner in the late 70s and early 80s. They are a vital part of a lot of childhoods, both during the original trilogy years and in the decades since. They’ve been featured in movies and commercials countless times over the years, representing something deeper in popular culture. They’ve taken on a life of their own, becoming an icon that’s separate from the films or even the characters themselves. To my way of thinking, those toys were art. They told a story that was their own, growing and changing as the years went on. They were the actors and props used to enact whatever adventures and dramas a child could dream. The toys were the product of the talent and dedication of hundreds of artists, all working together to create something which has been beloved by millions of people the world over. While many might dismiss their achievement as being merely commercial design work and not representing true artistic vision, I am of the opinion that the people behind the toys were very talented artists and craftspeople. They had skill and imagination which few could match. I don’t understand why anyone would ever hesitate to call their creations “art,” especially the early stages of the production process. It might not be art that everyone appreciates, but that doesn’t make its artistic merit any less worthy of respect. The toys are as much art as the films themselves, or Frank Lloyd Wright’s designs, or the Sistine Chapel, or any of the other ten thousand works which were originally done as commercial enterprises but which are now celebrated because they spoke to something deeper in us. To me, the toys are small plastic works of art, presented to children at $1.79 a pop. I believe the imagination of the artists who created them should be appreciated and remembered. Since there seems to be a general confusion among many Star Wars fans about how the vintage Star Wars action figures were created by those artists however, I thought I’d offer a step-by-step analysis. I will try to break down the collecting and engineering jargon into its simplest terms, because I’m assuming that most of the people reading this will be doing so out of curiosity and not because they have any real familiarity with the process or desire to understand every single complexity. I am trying to write this as an easy to understand overview of the production process, rather than describing every last detail. As such, if I oversimplify something or miss an aspect of a particular stage, you'll have to forgive me. Unlike the other online and print resources which attempt to illustrate the stages of production however, I’m going to be able to do it using only one action figure for all of my examples. 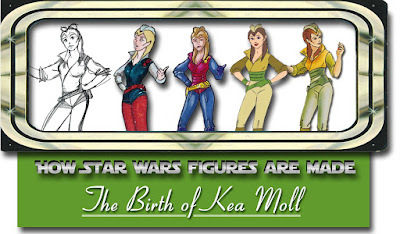 My assistant will be everyone’s favorite character from the Star Wars saga: Kea Moll. For the uninitiated, Kea Moll is a secondary character from the first arc of the animated Droids TV show, which ran for one season in 1985. The show followed the adventures of C-3PO and R2-D2 before the events of A New Hope (Episode IV), filling in the gap between the prequel and original trilogies. Kea essentially served as the show’s “Leia” character for 1/3 of its run; a Rebel freedom fighter and pilot who befriends our protagonists. To be honest, she doesn’t do a whole lot that’s especially noteworthy. She is probably as strong a female character as you’re going to find in an ‘80s cartoon show though, which is something, but doesn’t automatically make her a celebrated icon of female empowerment in the Star Wars fan community. No matter how unimportant she may be to most people though, an incredible number of things related to her character were saved. A true… Moll-titude of items (…sorry). There are simply more surviving stages of the Kea Moll action figure around than almost any other from the vintage era. For whatever reason, examples of just about every stage of her production were saved and I was able to acquire them over the course of the last 17 years. 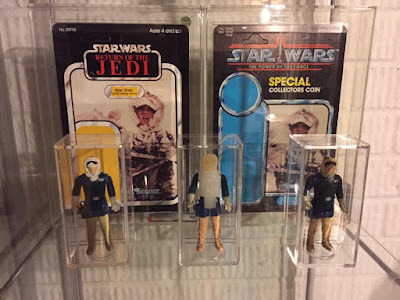 As such, Kea Moll can guide us through each step and illustrate how Star Wars action figures were (and for the most part still are) manufactured. Now, since she’s an animated character rather than an actor in one of the feature films, there are obviously going to be extra steps in her production process that a Luke Skywalker figure, for example, wouldn’t have gone through. But generally, those are design considerations rather than a question of the process itself. The basic stages of production would be the same whether we’re talking about Kea Moll, Boba Fett or the Rancor. Toy production is a pretty standard enterprise, no matter the character or line. We’re just going to start our journey a little earlier in the process than we would need to for a trilogy character played by an actor, since you can’t make an action figure of a character if you don’t even know what the character looks like. 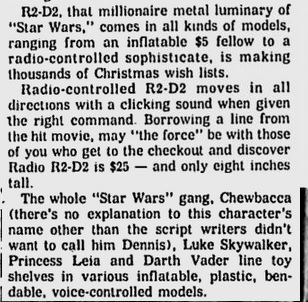 NOTE: for the purposes of this article, I will for the most part refer to the parties involved as “Kenner,” despite the fact that some of the tasks were actually performed by outside vendors or contractors. This isn’t to downplay the contributions of those artists or companies, it’s merely for clarity. I’m trying to keep this article as simple as possible, and toy production is complicated enough without involving the names of half a dozen different companies. Since we are dealing with such an obscure character, perhaps it would be best to first show the final toy in question so that you will be able to recognize it as the production process goes along. This is a vintage carded Droids Kea Moll figure, released by Kenner in 1985 (yes, this particular example is in *terrible* condition, but that’s beside the point.) This is the final product which we are trying to reach. 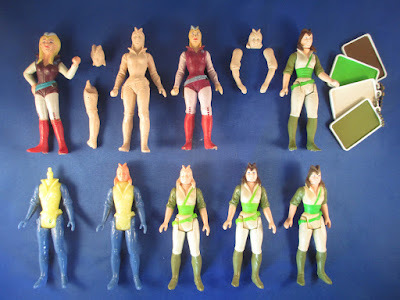 We are quite literally going to see every step until we get to this point again, from almost the moment of Kea Moll’s creation up until the point these action figures started lining shelves across the world. When a stage of this production process is missing, which very few of the important ones are, I will try to note where it would be placed in the sequence and link to a picture/description of what the stage entailed. Now that you know who Kea is and what her final toy looked like, we can start at the very beginning and show how we get to this point. Some of this stuff has never been seen publicly before. 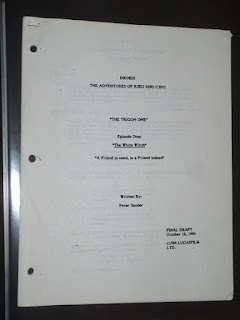 Original Script to "The White Witch"
If you wish to make a Kea Moll action figure from scratch, you must first create Kea Moll. As such, Kea’s birth begins here, with this original production used copy of a script from the Droids Star Wars cartoon show, written in 1984. 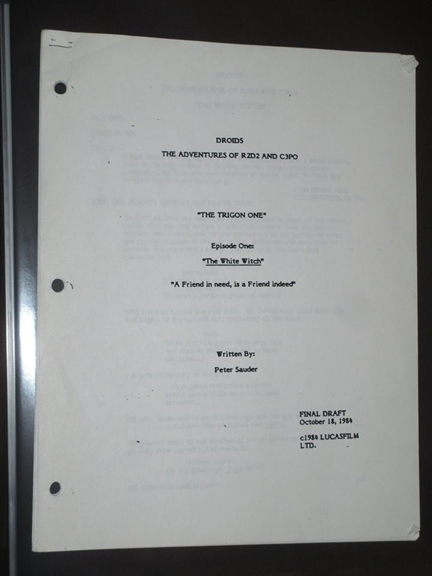 This isn't a modern photocopy -- this is the studio file copy of the final draft script, meaning it was the exact copy which was kept by the studio in case they ever needed it for some reason. It's "The White Witch," the first episode, in the first arc, of the show’s only season. It is also the first appearance of Kea Moll, which is what we’re concerned with at the moment. This script is essentially the first time her name appears in print in any kind of official capacity, so this is basically where she is “born.” In her first scene, her character is listed as "The Watcher," which is pretty awesome and makes her sound far more exciting than she actually is. Since this is still a draft script and not the final script however, the dialogue in this version is a little different in some places. Kea is portrayed more as a grease monkey than she is in the final cartoon, talking with Thall (our protagonist and owner of the Droids) about his speeder using racing jargon and the like. This draft of the script doesn’t specifically physically describe her however, referring to her only as "a girl," "The Girl," or "a teenage girl.” Since animation is a visual medium, this obviously presents a bit of a problem. Once the animation team decides a character is needed, the character designer begins coming up with designs for her, in sketches very much like these. 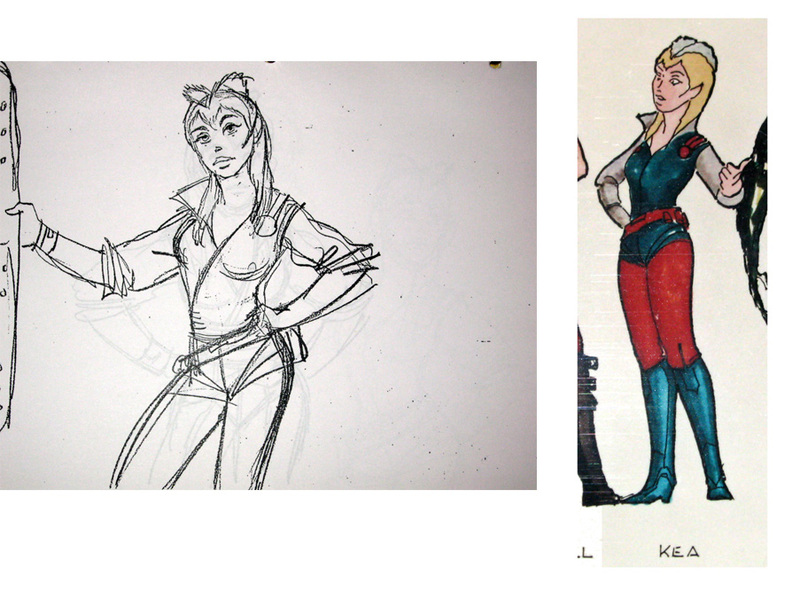 These are modern copies of early Nelvana sketches, originally drawn by one of their character designers. It was his/her job to just sketch random characters and things needed for the production of the cartoon. The character designer typically draws a number of different characters, letting their imagination run wild, until one of their creations speaks to him/her and that becomes the official “look” for a given character. The design can greatly affect the character, which is why it’s sometimes done before the script is even written or the story finalized. You’ll notice that in this early art, Kea almost always has one hand on her hip and one stretched out, gesturing to something. The character designer seems to have been going for a casual street-smart self-confidence and familiarity with a dangerous lifestyle. The character’s last name is "Moll" after the prohibition era "gun moll," the tough gun-toting girlfriend of a gangster. They named her ship “The Star Runner,” after the Rum Runners of the prohibition era to fit in with this idea. I assume they tried to pose her in a self-confident and slightly flirtatious way in this early art to get that idea across. The character designer’s decision to give Kea a certain confident swagger could also be why the dialogue in the final cartoon was changed, downplaying her mechanic background and making her more of a fighter. Thall Joben and Jord Dusat do most of the mechanical stuff in the final cartoon, while Kea does most of the fighting. She is one of the few characters in the entire run of the series who can actually hit what she’s shooting at, which given the accuracy of weapons in the Star Wars universe, is quite an accomplishment. 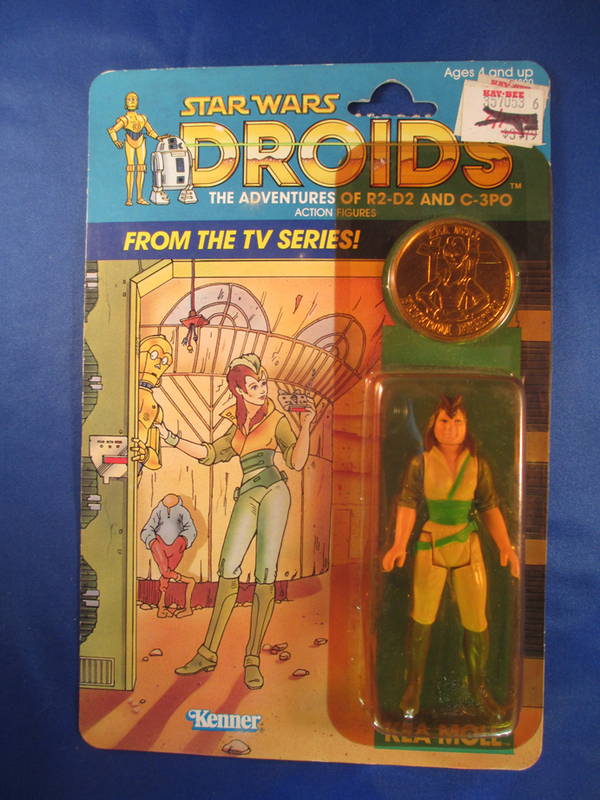 Nelvana and Kenner were working together closely at the time, since Kenner was planning a line of action figures based on the Droids cartoon. As any child of the ‘80s could tell you, cartoons of the era were often little more than animated toy commercials and that meant that the animation studio and the toy company needed to be on the same page at all times. 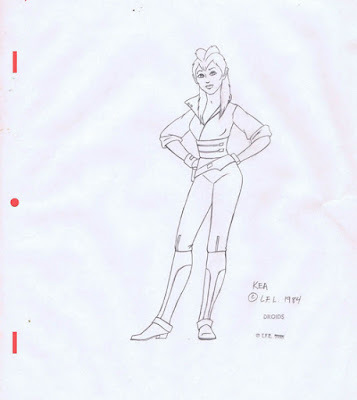 As such, Nelvana sent Kenner copies of their early artwork for the series, so that the toy company could begin their own preliminary work on Kea. 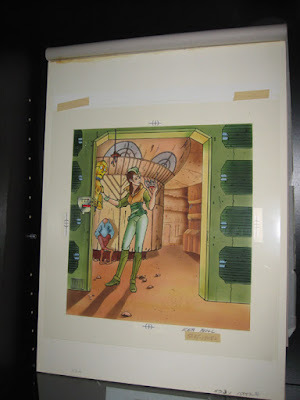 This is a modern print from an original slide showing Kenner’s version of the first Kea Moll concept art Nelvana sent to them. Kenner redrew Nelvana’s art, making it clearer and focused solely on Kea, so that they could get a better sense of who the character was. At this point in her creation, Kea is a blonde and dressed in a much more colorful outfit than she’d end up wearing. Sadly, to the best of my knowledge, the original art seen in this slide no longer exists. 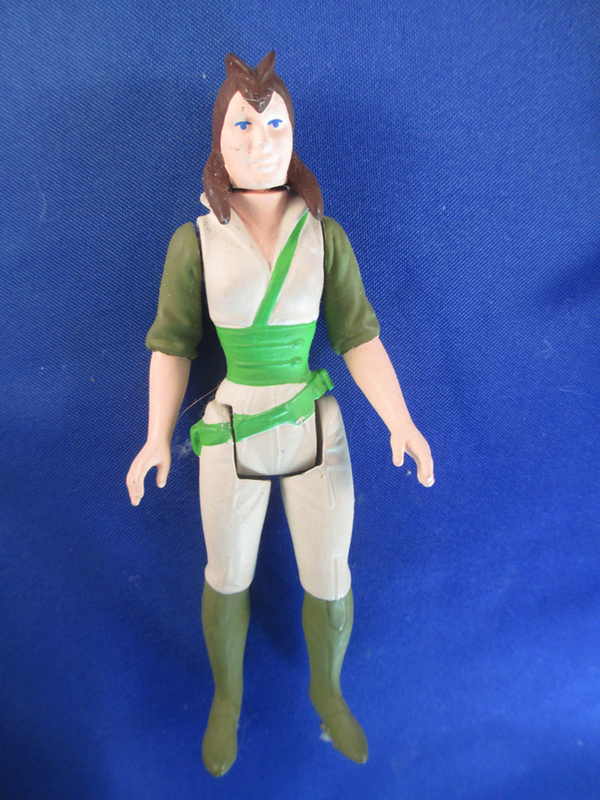 Kenner took the early image of Kea Moll they created and used it as reference to sculpt this non-poseable conceptual prototype out of wax. This is the very first time the character was ever realized in 3D. Since this is based on the early concept art, she is sculpted in the exact same pose, still a blonde and still in her colorful outfit. Kenner seems to have literally been doing a 3D representation of the concept art here. It's an almost exact recreation. I don't know what purpose they would have had for this, but I seriously doubt this wax figure was ever intended to be used to create anything in this form, especially since they almost immediately began work on a more refined sculpt for the character. I think they worked up this rough little wax figure and painted it for some kind of meeting or presentation, in order to show the Droids characters as 3D toys. When the meeting was over, they put it aside and forgot about it. As a followup to the Concept 1 Kea, Kenner immediately started work on a second. The first stage of the Concept 2 Kea would have been a clay rough, which can be thought of as a preliminary rough draft of the figure. The details on the figure are vague, for the most part, since all that matters is the general shape. The purpose of the clay rough is to make the sculptor's job easier once the sculpt reaches the wax stage, since the figure will already be in the right general shape and all he'll have to do is add in the details and refine things. 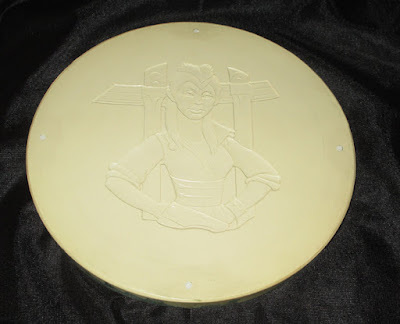 Once the clay rough is done, the sculptor makes a silicon mold of it and pours in the wax to produce an exact copy of his work in the new material. Very few clay roughs from the vintage era survive, but an example can be seen here. A wax cast doesn't really serve a role in the production process, but might have served a purpose to the sculptor. Oftentimes, the sculptor would store excess wax in the silicon molds he had created, which also helped to ensure that the mold kept its shape and didn't get distorted over time. When the wax was needed, he'd pop it out and use it. Any excess got poured back into the mold, and the process started over again. In this case, it appears that the sculptor was keeping wax in the silicon mold made off the Concept 2 Kea clay rough. As such, since this is a wax copy of the clay rough, this is our only look at what the earliest stage of the Concept 2 figure looked like. These little wax casts thus not only represent what the Concept 2 clay rough looked like, but also represents what the Concept 2 wax sculpt looked like before the sculptor started refining it by hand in the next step. You can see the details are very general here, just giving hints at what the final figure will look like. It could also be that this wax casts represents an attempt by the sculptor at getting a jump on the sculpt for the final figure, bypassing the concept figures altogether. He could use the wax cast of the Concept 2 as reference or even in place of a clay rough for the final figure, just to give a general shape which he could further refine in the sculpt of the final toy. This would save him time, if it worked. There's no real evidence that that's the case here, but it's possible. Sadly, since it was most likely just for storing the wax, large sections of this cast were melted down and recycled by the sculptor for use on other projects. This is the wax sculpt which resulted from the sculptor refining the detail on a wax cast identical to the ones seen in the last step. The sculptor made a mold of the clay rough, then poured this wax into it. He then refined the sculpt by hand, adding all the details. You can see it takes a considerable amount of work to make the wax cast of the clay rough into a presentable sculpt. By this point, Kea has begun to look more like an action figure rather than a little statue like she did in the Concept 1 version, although she is still non-poseable here. She's gotten curvier though and her hairstyle has changed slightly. 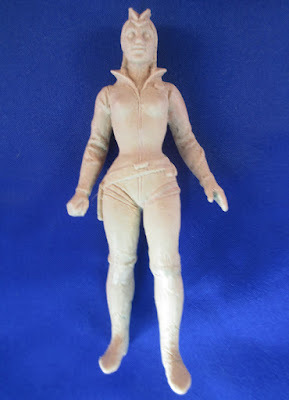 The Concept 1 Kea was merely a 3D recreation of the concept art, but this revised sculpt is the first time Kenner starts to do its own thing with the character and make her a little more toy-like in appearance. You can see some faint pencil marks, most notably on the inside of her arm. These were put there by the sculptor to show where the parting lines on the figure would be, as the two halves of the mold come together. This is the painted non-posable hardcopy, made from the Concept 2 Kea wax sculpt. The hardcopy is exactly what it sounds like: a hard copy of the wax sculpt. The figure is cast in resin because Kenner needed to create a more durable copy of the sculpt, so that they could use it for a variety of internal purposes like design meetings and presentations, without risking harm to the fragile wax of the original. I know of nowhere this concept was used however and they certainly didn’t create steel tooling with it, which is the main purpose of a hardcopy. This is also the only hardcopy of this figure that I know of, so whatever role it played, it was evidently a small one. You can see remains of glue on its feet, so it was apparently used in some sort of photography or display. It also seems to have been created very close in time to the Concept 1 Kea, since the alternate outfit is exactly the same and her hair is still blonde on both. 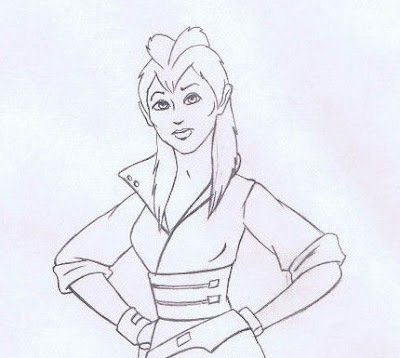 Judging from Nelvana’s art, she wasn't blonde and wearing that style outfit for very long in her development, so I think Kenner did the Concept 1 Kea and then immediately did this second concept of her. This internal Kenner photo negative (this is a positive modern print of it) shows what would have been the first time Kea Moll was shown on cardback. The mock-up was created using a cardboard cutout of Kea inside the bubble, since the actual figure wasn't ready yet. This particular mock-up was created at some point after the Concept 2 Kea hadcopy was made, but before the actual final figure was sculpted. You can tell this because the cardboard cutout of Kea has brown hair, while the Concept 1 and 2 Keas both have blonde hair. Interestingly though, Kenner simply reused Nelvana's conceptual art for the images of the characters on this mock-up cardback. They copied the early art sent to them by Nelvana and simply changed Kea's hair color in the image. But otherwise, Kea, Thall and Jord are lifted entirely from that early art. The art for the Kea cardboard cutout used here actually still exists as well and can be seen here. While Kenner was busy taking the first steps in the creation of the Kea Moll action figure, Nelvana was still working on the character themselves. Nelvana had previously sent Kenner conceptual designs for Kea, but they were never meant to be her final look. These were the final design images Nelvana sent to LFL to show them what they wanted the character to look like, and one presumes, Kenner received a copy of them as well. Once approved by LFL, these images were copied into a collage and sent to all the animators at Nelvana, becoming the basis for every time Kea is shown in the cartoon. This allowed the animators of the cartoon to keep her look consistent throughout the series -- a difficult task considering the hundreds of thousands of individual animation cels needed to produce the show. If they drew something that didn't match the look shown here, it was deemed "off model" and would be redrawn. As such, these are, in a sense, the images of Kea Moll, from which all others are based. Whatever Nelvana drew or Kenner sculpted after this, it would need to match these drawings. You can see the stamp from Lucasfilm, indicating that it was approved by Lucas, as well as the signature of someone named "Ken." 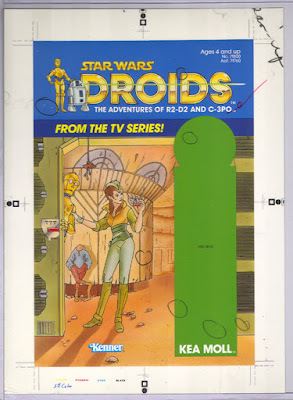 I don't believe that’s the artist, but rather the director of the Droids series, Ken Stephenson, signing off on this version of the character. Once the model sheet is approved, Nelvana set about working on the model cel. This cel wasn't used anywhere in the cartoon itself, because it was used everywhere in the cartoon. 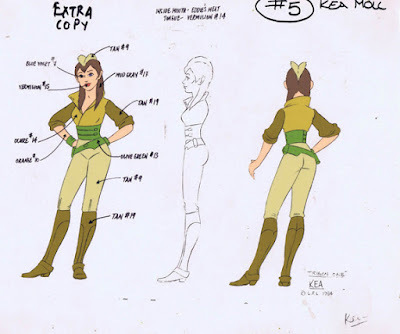 It's using the model sheet pencils as a base, but instead of showing the animators the correct way to draw Kea, the model cel is showing the ink and paint department which colors to paint Kea and where. This helped to ensure that her look was consistent throughout the series and that she didn't suddenly have different color hair or clothes. 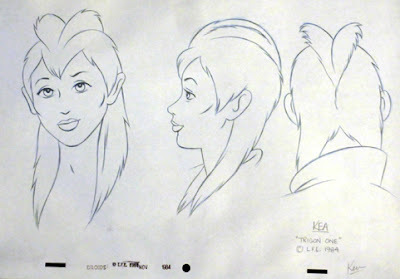 At this point, Nelvana probably would have shared the model sheet and model cel with Kenner so that Kenner would know exactly what Kea looked like in the final cartoon. Since Nelvana’s work was drawn from an animation perspective though, Kenner would have had to take that art and do their own turn-arounds of it from a sculpting and engineering perspective, very much like this Sy Snootles Color Specification Sheet. The drawings/blueprints Kenner produced (which collectors sometimes call "Color Specification Sheets") would have had to show the proposed figure from every angle, the scale of the figure, the colors used, and make note of any engineering challenges or features which would need to be included. Sadly, the color specification sheet of Kea Moll has never turned up. It is at this stage that most of the figures based on trilogy characters would have begun, since it's the stage where reference photos become translated into a toy. Kea had to go through the character design process first, but an actor wouldn't need that, obviously. Internal LFL photographs of the actors and costumes would be sent to Kenner, and the turnarounds done from those. During this time period, the accessory destined to be included with the Kea Moll figure would also have been planned. Since the weapon chosen for Kea was a recycled Squidhead blaster from Kenner’s Return of the Jedi line (replaced with a grey Stormtrooper rifle in the Brazilian release of the Kea Moll figure), no additional steps would be needed to produce her accessory. 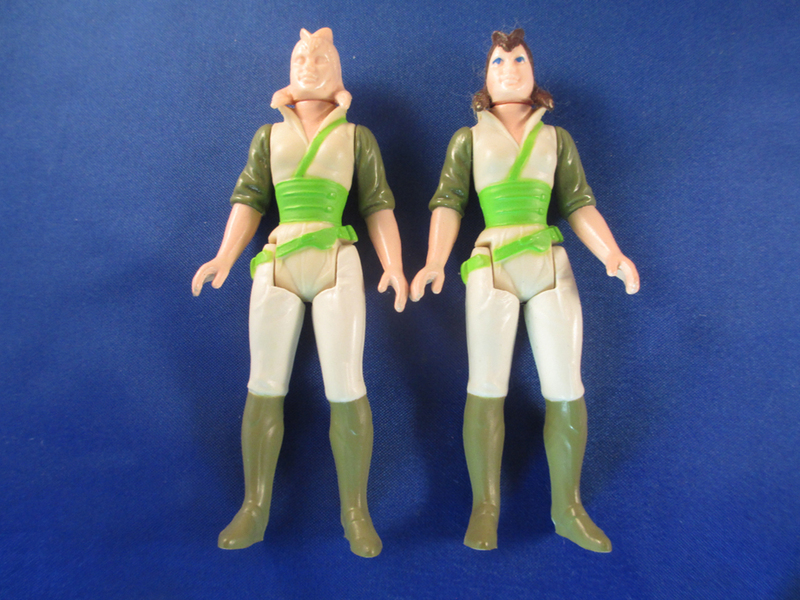 Kenner already had the finished toy on hand, so all they had to do was start producing them for Kea’s figure as well. 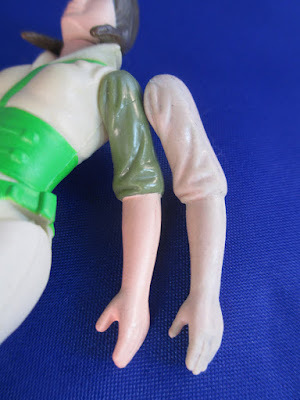 If Kenner had chosen to create a unique weapon for her however, they would need to design it and create a blueprint for it at this time too, in order to ensure that it could fit into the figure’s hand. The resulting plan would look like this technical rendering for the of Klaatu Skiff Guard Weapon. Once the technical rendering was made, the weapon would follow the same basic stages of production as the figure itself. 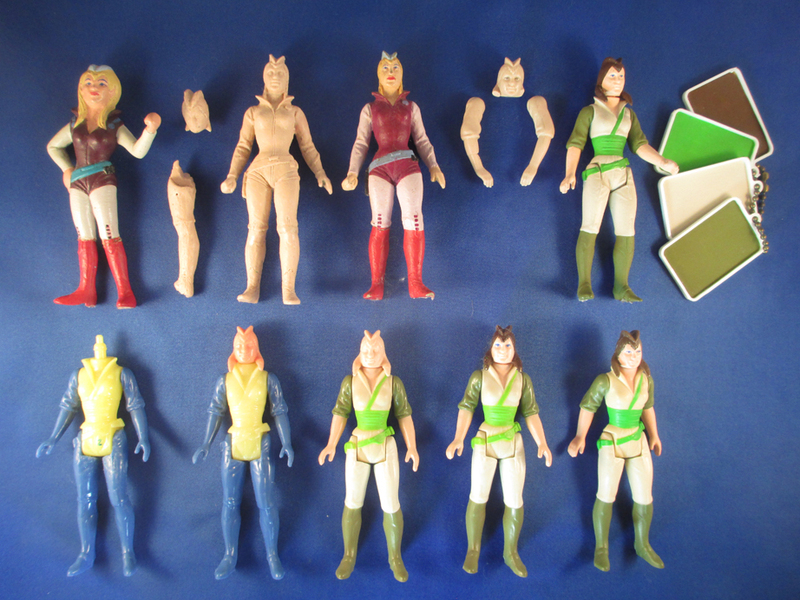 Kenner would occasionally decide to create a preliminary version of a figure or toy using existing parts which they modified. Sometimes they recycled their own toys, sometimes they’d use a competitor's, pieces of a model kit, whatever worked best to achieve the look they wanted. They'd repaint them, add additional sculpted details, swap out parts, etc. 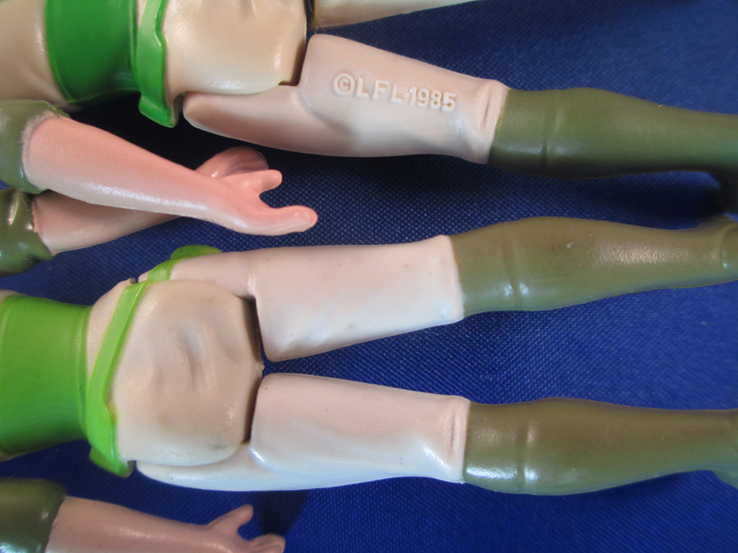 The only purpose of these Franken-figures were as mock-ups to show what the completed figures might look like. They were simply preliminary models, not something ever intended to be final. The most famous example of this is probably the kit-bashed Boba Fett action figure, which appeared in a number of early materials. 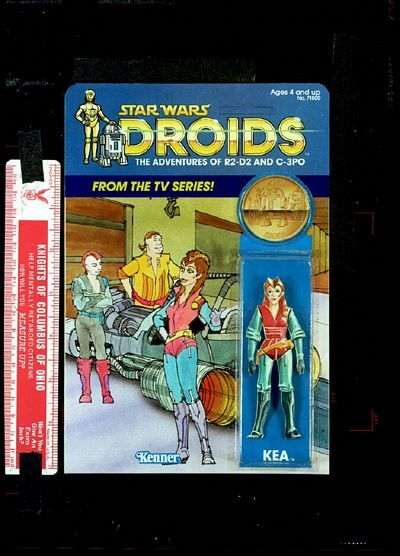 In the case of Kea Moll, no such figure was needed, since Kenner already had the conceptual versions of the figure and the cardboard cutout of the concept art they used in the mock-up cardback. If they needed a model of the figure, they already had several options and no additional mock-up figures were needed. 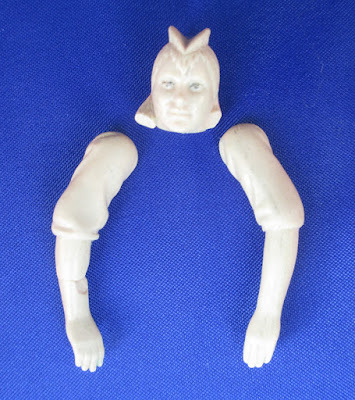 Now that Kenner received the final design for the character and had planned out the accessory, they could begin sculpting the final action figure itself. Unfortunately for them, in this instance, the change from concept character to final design was drastic. No elements of their conceptual sculpt could be recycled, although a wax cast of the Concept 2 Kea might have been used as a starting point for the sculptor. It theoretically could have been possible, but whether or not the sculptor tried to go in that direction is unknown. In either case, a new sculpt was created. These are the original wax sculpts for Kea Moll’s head and arms. Each is sculpted by hand around a plastic disk to make assembling the sculpt easier and to provide a base for the wax. When you compare it to the production figure, you can see the loss of detail and general distortion which results from the molding and tooling processes. The production figure looks bloated and almost melted in comparison to the fine detail of the sculpt. Think of it like making a Xerox; the further you get from the original document, the more detail you lose. The wax sculpt is very clear, but by the time you get to the production figure (a copy of a copy), the figure doesn’t look as sharp. In fact, the Kea figure ends up being rather homely at the end of the process. 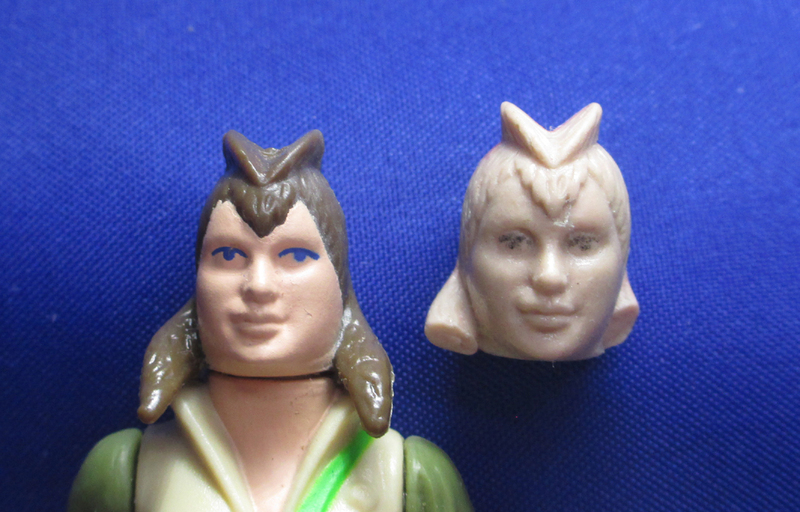 But no matter how it ended up, every single Kea Moll figure ever released is a copy of this sculpt. Again, you can make out the pencil lines the sculptor added to show where the parting lines on the figure would be. It is important to plan that out, as it can have a profound effect on the final figure. If planned incorrectly, it could destroy the sculpt in the mold-making process or greatly increase the cost of production. In this case, the sculptor has also added in Kea’s eyes to make her face complete and give it character. Sadly, the sculpts of Kea’s torso and legs do not appear to have survived and this is all that remains of her sculpt today. At this point in the creation of the figure, Kenner made a hardcopy of the Kea sculpt. Again, a hardcopy is a hand-made resin copy of the original wax sculpt, created to provide a harder figure which could be used as a step in tooling the final steel molds. The hardcopy was created by making a silicon mold of the sculpt and then pouring in a white/off-white resin material that Kenner used on a lot of Droids and Power of the Force era prototypes. Once removed from the mold, the new figure would be a hard resin copy of the sculpt. The limbs and head of the figure are typically held in with pins and are removable. The role of the hardcopy is rather technical, but to simplify the process in your mind: imagine needing to use a machine to trace every detail of a wax sculpt using an ice pick or needle. You wouldn’t be able to do it, because the sharp point would destroy the delicate wax. It's too soft and can't be used for the job. As such, a copy of the sculpt in a harder and more durable material was created, so that it could better stand up to that process. Since hardcopies are copies of the sculpt, they are much more detailed than the production figure, as they’re one step closer to the original. They are also slightly larger, due to the shinkage of the final plastics used on the production figure and the general loss of size from the mold-making process. Generally, each generation (our Xerox copies analogy again) is going to be slightly smaller than the one before it. 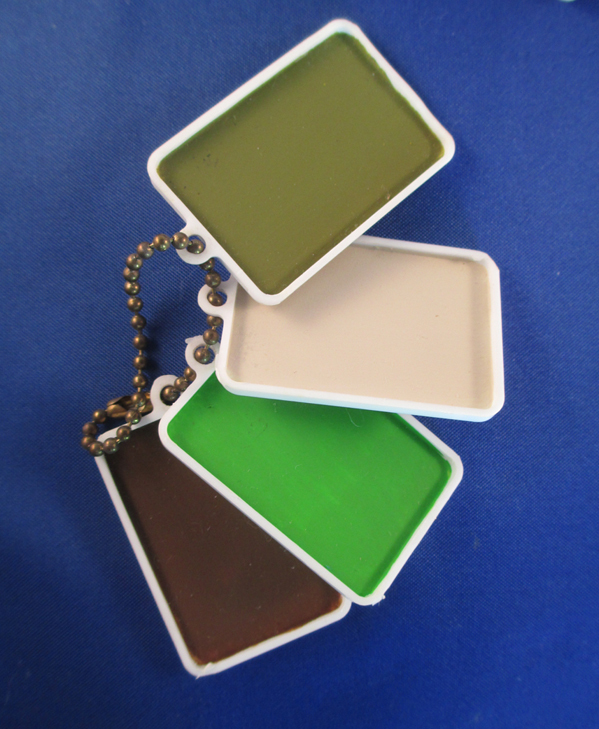 Hardcopies do not have copyrights or footholes, and they aren’t made of plastic (they're made of resin). All of that comes later in the process, once the final steel molds are created. 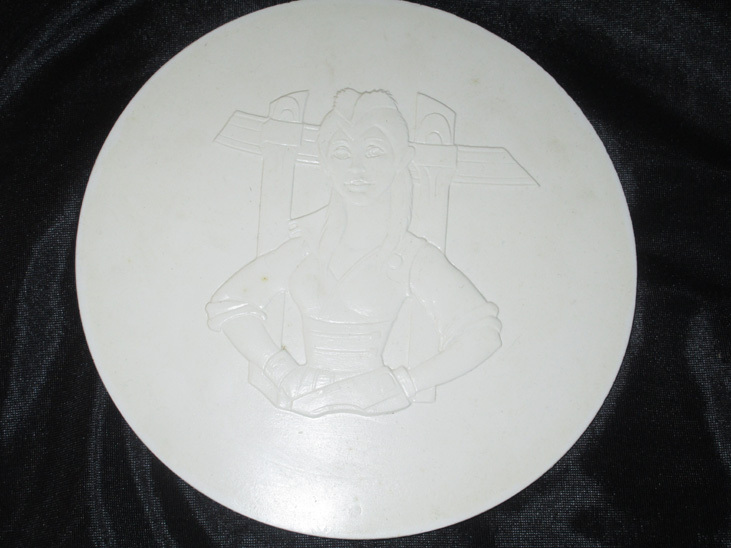 Hardcopies are a product of the silicon mold made from the wax sculpt, and none of that was molded in yet. This particular Kea Moll hardcopy is called a "paintmaster" because it's job concerned the paint details on the figure, rather than being created to help tool the steel molds (the "tooling master," which wouldn't have been painted). If you’ve ever looked on the back of a toy’s packaging and thought to yourself, “Hey, that doesn’t look anything like my toy. It’s more detailed and beautifully painted,” that’s because you’re almost certainly looking at a paintmaster hardcopy. Photography is one of their primary purposes, since the pictures for the packaging were usually taken before the final figures were ready, and the extra details/hand-painting made the paintmaster hardcopies look better in pictures than a production toy would anyway. To accompany the paintmaster hardcopy, Kenner also created these paint chips (sometimes called “paint swatches”), in order to show vendors (the people overseas who actually produce the toys for Kenner) the correct colors to use when painting Kea. Much in the way the model cel kept the colors on every animation cel depicting Kea consistent, these paint swatches made sure every Kea action figure would be the same colors. The back of each swatch is marked "Kea," unsurprisingly. Sadly, the blue swatch, showing the color for Kea’s eyes, was lost to time. 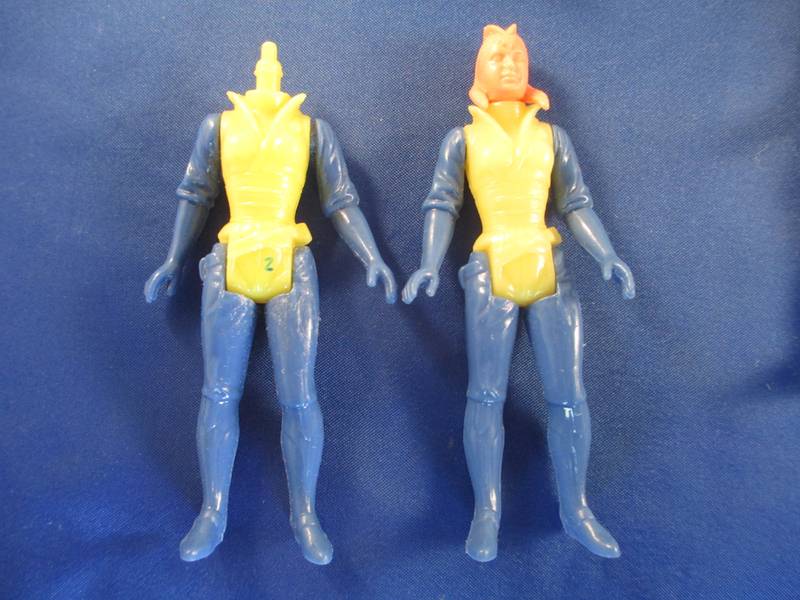 Once Kenner had a tangible and durable prototype of the figure in hand, they often used it in a carded mock-up. A carded mock-up is a figure (a hardcopy, a first shot or sometimes even a production figure), paired with a matching proof card and presented as a stand-in for the final packaged toy. 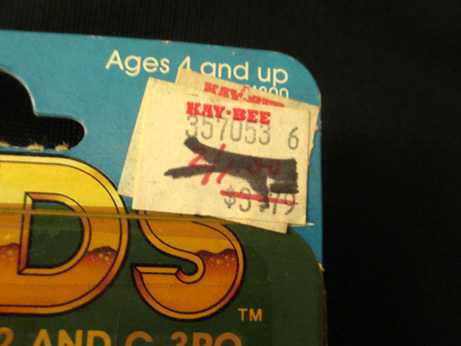 Typically, Kenner would hand-cut a plastic bubble, stick a hardcopy or first shot in it and glue/tape it onto a proof. This allowed them to get a real sense of what the toy would look like once it hit the shelves. Mock-ups were also sometimes used in photography and trade shows to announce the figure. 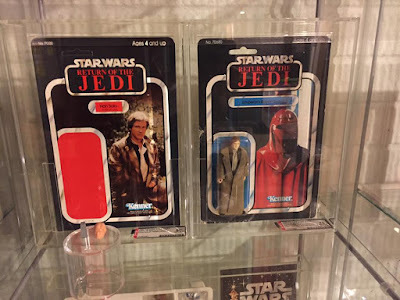 Many of the carded figures seen in vintage Kenner commercials were actually mock-ups, simply because that was all Kenner had at the time, since the production versions weren’t finished yet. No Kea mock-ups have ever been found, but you can get an idea what the step looks like here. At this point of the process, Kenner occasionally produced a stage called a “protomold” (sometimes incorrectly called an "Internal First Shot" by collectors). No Kea figures of this stage have ever been found, if they were made at all. Essentially, the stage involves locally producing figures in low yield aluminum molds, rather than waiting for the overseas vendors to send back the toys created in the final steel molds. These figures wouldn't have been used in the tooling process, like the hardcopy, but rather for photography and to simply have additional samples of the figure on hand. The details on a protomold are sometimes rougher than you'd see on a hardcopy or even the production figure. They're also sometimes smaller than the production figure and they lack footholes and copyright markings. The hardcopy is used as a stage in the creation of the steel molds which make the production figures, but it does not create the steel molds by itself. The hardcopy is used to create the tooling aid, which creates the tooling (the final steel production mold.) 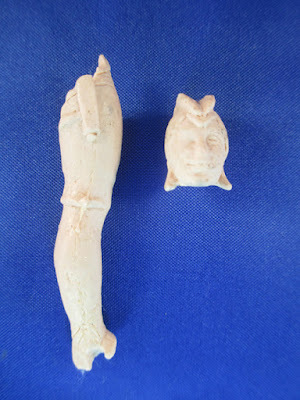 Unfortunately, collectors don't really know a lot about what those tooling aids for the 3 3/4" figures looked like. Judging from other toy lines though, the tooling aid would have been created using the hardcopy and would have been a negative copy of the front and back of the figure. So, imagine two blocks, one with an impression of the front half of the figure and one with an impression of the back half of the figure. The details of these tooling aid blocks would then be traced and tooled into the steel mold, copying them. Some pieces/parts may have used a different means or even produced molds in metals other than steel, but that's the basic idea behind this stage. For collectors though, we usually just say that the hardcopy creates the steel molds, simply because it's easier to understand and isn't a question mark. Plus, most collectors don't care about the stage anyway, since no tooling aids for the 3 3/4" figures have ever shown up. For the sake of completeness though, this is where the tooling aid would go in our rundown of the process. While one Kea hardcopy was used as a paintmaster to guide the painting process using the paint swatches, another Kea hardcopy was used as the tooling master, which creates the tooling aid, which makes the final steel molds. So, the steel mold is a copy of the tooling aid, which is a negative copy of the tooling master hardcopy, which is a resin copy of the original wax sculpt. 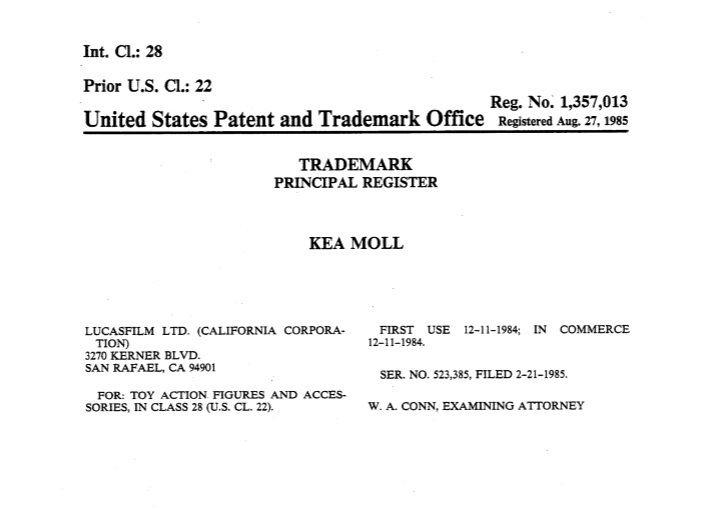 The steel molds are what actually produce all of the Kea Moll figures that Kenner wants to sell. Every figure sent to stores is a product of the steel molds. For lack of a better analogy, think of the final steel molds as a muffin pan. You pour in the batter (plastic) and out comes the muffin (figure). Only in this case, the plastic/batter is shot into the mold under pressure, filling up the Kea Moll shaped cavity created as the two halves of the mold/muffin pan close, and then the mold opens again. Tiny automatic pins in the mold eject the toy pieces from the mold into a bin and the process repeats. If you’ve ever looked on the back of a plastic army man or model kit and saw round circles in the plastic, that’s the imprint of the ejector pin, which pushed the plastic piece from the mold while it was still soft. You can see an example of a steel mold here. Since the creation of an action figure is a large-scale enterprise interested in quantity and speed, the steel molds would produce several of each piece at a time, connected by plastic. Again, if you think of how the pieces of a model kit are all connected on single piece of plastic and you have to snap off the pieces you want, that’s because they were all created in one mold. The piece of plastic which remains from where the molten plastic was introduced to the mold and connects the pieces, is called a sprue. 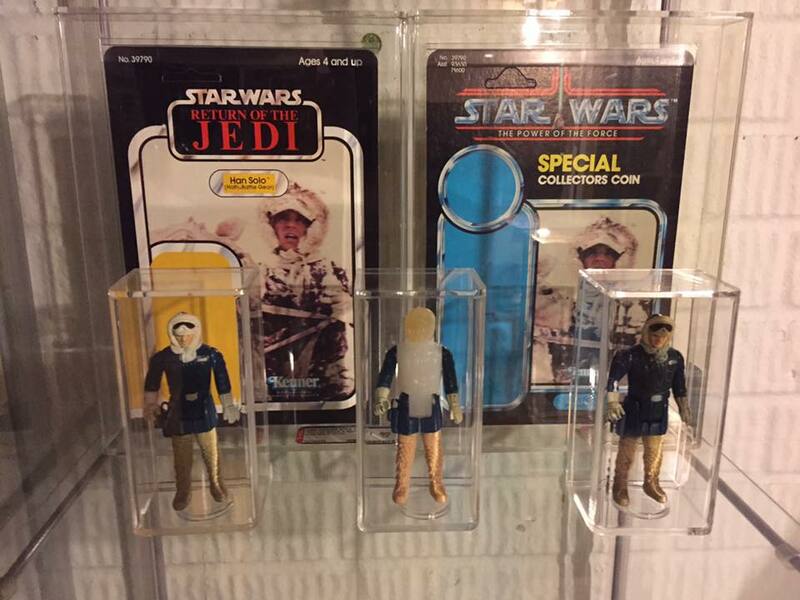 Vintage Star Wars figures were manufactured much the same way, and you can see an awesome example here. Sadly, no examples of Kea Moll pieces with the sprues still attached have ever been found. A “bench shot” is a figure made at the mold-making facility, rather than being made at the overseas vendor which produced the production figures for Kenner. The mold-maker uses the tooling aid to create the steel mold, tests it out with whatever plastic he has on hand at the time, then sends the completed mold off to the factory. Those figures he produces as tests would be bench shots. To be perfectly honest, I don't completely understand this stage and I don't know anyone who does. It's so obscure and so rarely seen that collectors don't know a whole lot about it. It's one of those stages where there are two or three pieces which are confirmed bench shots based on their provenance, and then others which are questions marks because the figures look almost exactly like first shots produced later by the vendor. Collectors come up with various theories on how to spot them and what the differences might be, but none of it is really definitive, so I won't speculate. For informational purposes however, this is where the step would fall in the production process. Since no Kea figures of this stage have ever been found though, the point is moot. Once the steel mold is created and sent to the vendor, those first figures out of it are called first shots. A first shot is exactly what it sounds like: it’s the first time plastic is shot into the steel mold by the vendor. Again to use the muffin analogy: they're the first muffin out of the oven, which the baker taste tests. A first shot is created by machine, using production quality plastic, in the final steel mold. It lacks the detail of the hardcopy, since it's one (technically two) generations later, and is a product of the final steel production mold, which means it is the same size as the production figure. The first shot also typically lacks copyright markings and (occasionally) the footholes on the bottom of the figure’s feet, which were all added to the steel molds at a later time. 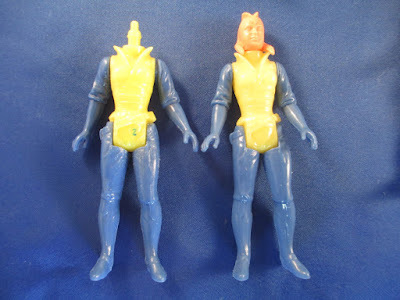 The two shown are shot in non-production colors, most likely because that’s simply the color plastic the company had in the machine that day. Since first shots were not meant to be sold to the public, it really didn’t matter what color they were shot in. They were simply tests of the machine. The headless one is not sonic-welded, meaning all its limbs are removable, and each has been marked and numbered by an engineer at the factory. The second first shot is complete. This variation of Kea Moll first shot is usually referred to as a "pull-test," which means that Kenner tested the figure's construction by seeing how much force it would take to rip off Kea's head and limbs. Since many of the pieces used to create an action figure could present a choking hazard to children, it was important to see if a child could easily remove and swallow them. Once Kea passed the pull test, the company was ready to start doing other first shots, continuing to try out the steel mold. As the figure nears completion, it comes closer and closer to the final look. The Kea figures still lack footholes and copyrights however. While most first shots have footholes, Kea is one of the exceptions and first shots of her can be found without them. First Shot Kea Moll compared to production figure. Notice the lack of footholes on the first shot. The first shot on the left in the top picture has an unpainted head because the company was still working on the final paint apps for the figure, while the second is fully painted. Painting the figures (both the first shots and the final production figures) was done using a process called "paint masking," which can be thought of as a stencil. Essentially, the figure was covered with a metal shield which exposed only the parts of the figure which had to be painted a particular color. For example, there was a paint mask for the blue of Kea's eyes, meaning the paint mask would cover every bit of the figure except where that blue paint needed to go. That color was airbrushed in by hand, only reaching the figure in the open spaces left in the mask, and then another paint mask was put over the figure, exposing only the areas which needed to be painted in a different color. In this way, each color was painted in turn, as determined by the color specification sheet and the paint chips included with the hardcopy. It's a labor intensive and expensive process, which is why action figures typically use as few colors of painted details as possible. Once she reached this stage, engineers would have examined Kea, making sure she met all specifications and that changes weren't needed. 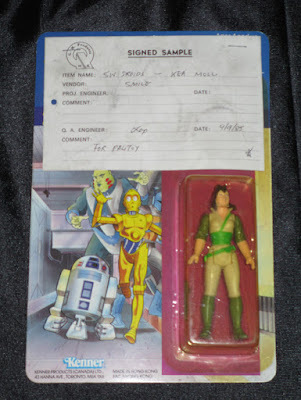 They would send the figure back to Kenner for their approval as well, such as this Barada Bagged Sample. In this case, no changes appear to have been made following the first shot (aside from some slightly different paint masking on her eyes) and full-scale production of the figure began. Once the steel molds were altered to include copyrights and (in this case) footholes, an "engineering pilot" would be produced. An engineering pilot (“EP”) would basically be a production figures for all intents and purposes. EPs can be thought of as being peri-production rather than pre-production, being "at, or near, the time of production." It's literally a case where EPs are production toys, they're just the first figures produced out of the altered steel molds once the copyrights and footholes were added. They're pre-production only in the sense that they still serve a purpose to the manufacturer and aren't sent to stores. However, they're truly of production quality and only pre-date the production toy by a very small amount of time. They are the last step, as the engineer checks the altered mold for issues. Sometimes they're signed, sometimes they're not. Sometimes they're tested again for durability, sometimes they're not. It's just a general term for the first figures off the line when the steel mold is changed, and without provenance, they are almost always indistinguishable from production toys. A nice example of an engineering pilot can be seen here. No Kea Moll EP figures have ever been found. They could very well exist, but since they’d look identical to the production figure, it’s almost impossible to know. After the engineers sign off on the EP, full-scale production of the Kea Moll figure would begin. Kea Moll figure pre-production run: concept pieces lead to the original sculpt, which creates the hardcopy, which helps create the steel mold, which produces the first shots and the final figures sold in stores. 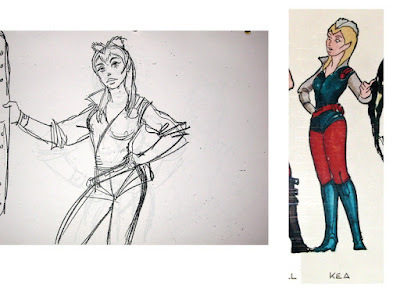 So, to recap the process so far: the writer created Kea Moll, the character designer drew some basic images of what she looked like, Kenner got the conceptual art of Kea Moll from Nelvana and had one of their artists do their own version of it, Kenner used that art as a guide to sculpt the Concept 1 Kea in wax, did a clay rough of the Concept 2 Kea and made a silicon mold of it, made a wax cast in the Concept 2 Kea mold in order to store extra wax/preserve the mold, refined a different wax from the mold into the Concept 2 Kea sculpt, created a painted hardcopy of the Concept 2 Kea, did a mock-up of the carded figure using a revised design of the character in order to show what she'd look like when she hit the stores, received the final character design of Kea from Nelvana, decided what weapon should be included with Kea, sculpted an entirely new version of the figure out of wax, made a silicon mold of the wax sculpt to produce resin hardcopies of the sculpt so they'd be more durable, created paint swatches/chips to clearly show which colors of paint to use on the final figure, used the hardcopy to create the tooling aid, used the tooling aid to create the steel mold, used the steel mold to produce first shots in non-production colors as pull tests to see how much force it would take to rip off Kea's arms and legs, produced partially and fully painted first shots in the steel mold as tests, added copyrights and footholes to the mold, produced some engineering pilots to double-check that everything was correct, and finally began full-scale production. Everyone still following me? Good, because that isn’t the end of this. Having the Kea Moll action figure in hand didn’t solve all of Kenner’s problems. They would still need something to put the figure in. This is the first step in the package design process, the original artwork to the Kea Moll action figure cardback. It's done kind of like an animation cel, where Kenner (or in this case one of its outside art suppliers) took a clear sheet of animation acetate with the character lineart on it, and then put the colors down on an art board beneath it. This makes the contrast and definition of the piece very high, because all of the black lines are on a separate removable sheet. Since Kea changed so drastically from original concept to the production figure, we can date when the artist was painting this cardback. 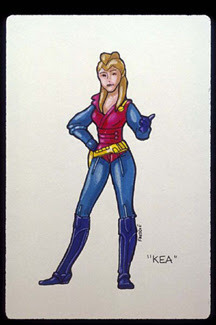 Kea appears as she does in the final cartoon and figure, so this cardback was painted later than the Concept 2 Kea and (obviously) the cardback mock-up. Which means that Kenner was working on the figure at a considerably earlier date than the cardback. Which is obvious when you really think about it, since the figure takes more lead-in time and is a more involved process than printing cardbacks. Still, this is probably one of the only times in the vintage line that this scheduling is so apparent. Kenner didn’t pull the layout for this art out of thin air though, and both Kea’s pose and the hallway she's standing in were part of Nelvana concept art. 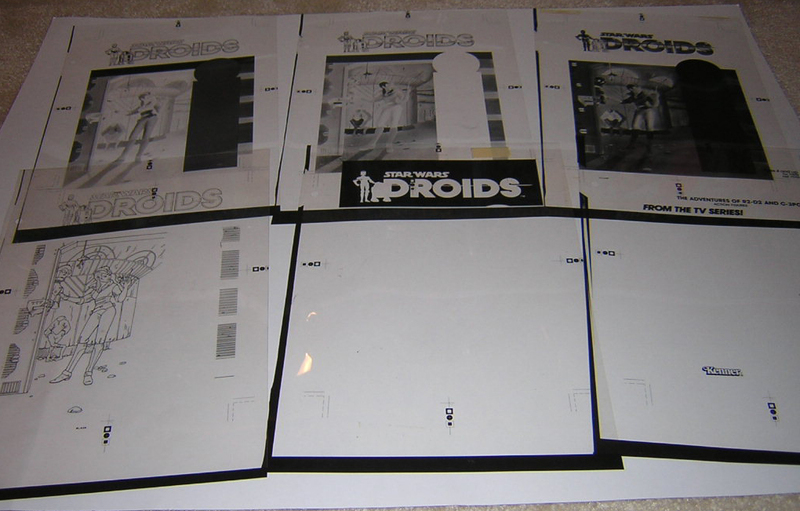 Most of the Droids cardbacks were taken almost exactly from the earliest Nelvana art. Unfortunately, I've never actually found the final conceptual image used as the basis for this cardback in Nelvana's art. I suspect there was one, based on sketches and later conceptual uses of this hallway, but it's currently missing. As a side-note: if you look carefully, the guy in the background standing against the wall behind Kea has no head. I have no idea why he was painted that way, but there are no signs his head was painted over. 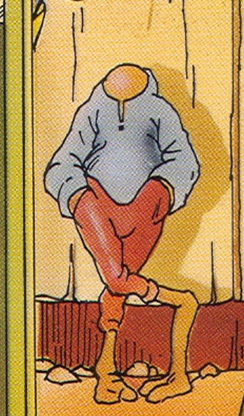 The character also appears in conceptual art of the hallway (but not in the actual cartoon) which means he was deliberately drawn without a head for some reason. The cardbacks to the Droids figures are weird sometimes. I once took a poll in the vintage community to give the headless guy an unofficial Expanded Universe-style complicated name, and the winner was: "Yargmot Vemy." So, there you go. His official unofficial name. Incidentally, for the trilogy figures, the cardbacks are photoart, rather than original art. Basically, photos of the character are heavily modified and airbrushed to create the look the artist wants. Then, they're used exactly like the artwork here would be. They serve the same purpose, they just have a different name and a different origin. The next step in the process is to create a mechanical of the cardback. Black and white copies of each component (art, logo, text, etc) are glued down onto an art board, planning out where everything needs to go and what size it needs to be. This allows the printer to see how it’s all going to fit together and what it will look like once the card goes to press. To date, no mechanicals of the Kea Moll cardback have turned up. Now that Kenner has received the final Kea cardback art from their art supplier and used the mechanical to plan out how it should be arranged, the next step is to turn the art into films, which help to create the actual plates which would be used to print the final cardback. Each of these separation sheets represent one of the colors used in the final image: cyan, magenta, yellow and black. So, for example, the black sheet shows only where black ink needs to go on the final cardback, and the yellow sheet shows only the yellow, etc. The 4-color printing process needs to lay down each color in turn, producing the final image once the cardback went to press. The film/separation sheets were used to create the "cromalin," which allow the printer to do color management and correction, in addition to simply check that everything is as it should be on the cardback. In other words, the proofing of the cardback was done at this stage. Cromalins are one-sided and printed on slick photo-like paper. Each color on a cromalin is actually printed separately on a clear sheet and then affixed together into one image, which creates very vibrant colors. The process is expensive though, so there are typically fewer cromalins of each character than proofs. 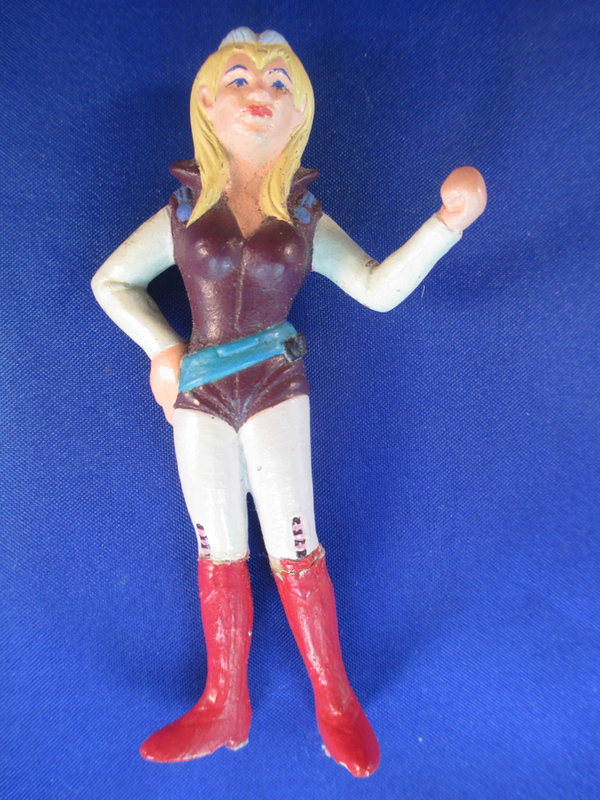 For Kea Moll, 3 cromalins were created, which is a large number for a vintage figure. Typically, most vintage figures only required one cromalin. Since the primary purpose of the cromalin is to proof colors and text, many of them are marked up with changes that are needed. In this example, you can see where the printer has circled imperfections in the image, so that they can be corrected on the films. This helps to ensure that the image is perfect when the plates are created and the cardback sent to press. This proof card is an early printing of the Kea Moll cardback, done for internal purposes such as mock-ups and samples. It looks like an unused cardback, but it is not a product of the final printing plates and usually differs from the production cards in a number of ways. Proof cards don't really serve a formal purpose in the actual production process on their own, since the films had already been sent to Asia to create the plates used to print the production cardbacks. Kenner just wanted some examples of the Kea cardback and didn't want to wait for their overseas vendors to send them. At this point, the films would be used to create the actual printing plates which churned out the production cardbacks themselves. I’m not aware of any surviving printing plates for the vintage cardbacks, sadly. The final step would be to start printing out the cardbacks seen on the production toys. Although, technically it would jump from Films straight to Printing Plate, since the Cromalin is simply used to correct mistakes on the films and the Proof Card has no real role in the engineering side of the cardback at all. But collectors don't really think about it that way, because it's confusing and messes up the orderly linear progression of the stages of development. 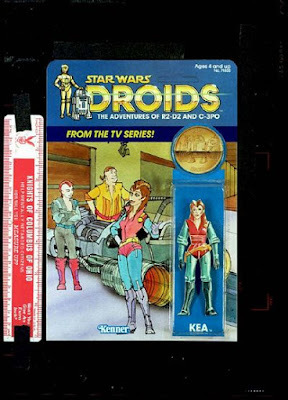 The figure and packaging have now been designed, but while all of that was going on, Kenner was also working on the pack-in they planned to include with the Kea Moll toy. 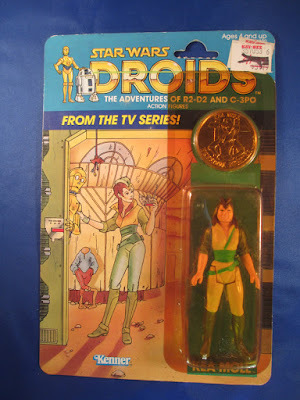 Kenner didn’t have faith that the Kea Moll name could carry the Droids line on her own (the fools), so they wanted to sweeten the deal for consumers by giving them something extra for their money. Kenner decided that the perfect way to do this would be by continuing their Power of the Force coin promotion, and include a Droids coin in every package. Interestingly, the original idea for the coin as a pack-in wasn’t even Kenner’s, it was actually pitched to them by one of the mints who produced the coins. 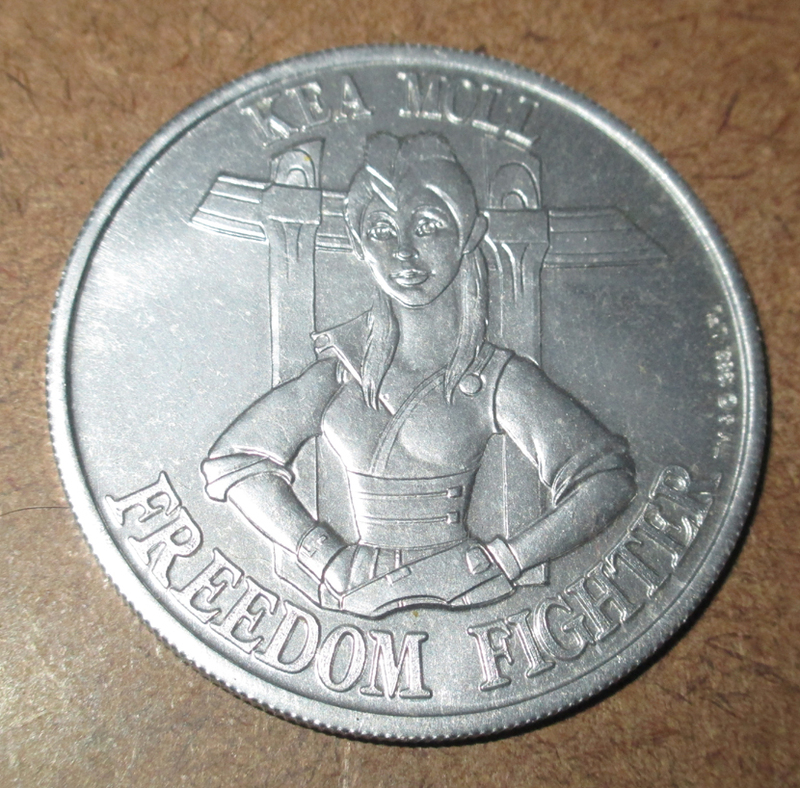 The mint simply thought coins would be a good idea and took the concept to Kenner to offer it to them. The Kea Moll coin began life with original art, showing what the final coin would look like. Sometimes done on vellum and sometimes simply a Photostat (like a Xerox) of the model sheet of the character, the art would show the front and back of the coin, exactly as it was planned to look. Although the art for the Kea Moll coin itself no longer exists, it was largely based off of Nelvana’s model sheet for the character, so in a sense, this is the original art for the original art of the coin. The next step was to sculpt the coin at 6 times its production size. This allowed for a great amount of detail to be included and would make sculpting it easier. Typically, the sculpt would have been done out of plaster (although sometimes other materials were used), with the details rising above the surface just like on the production coin. 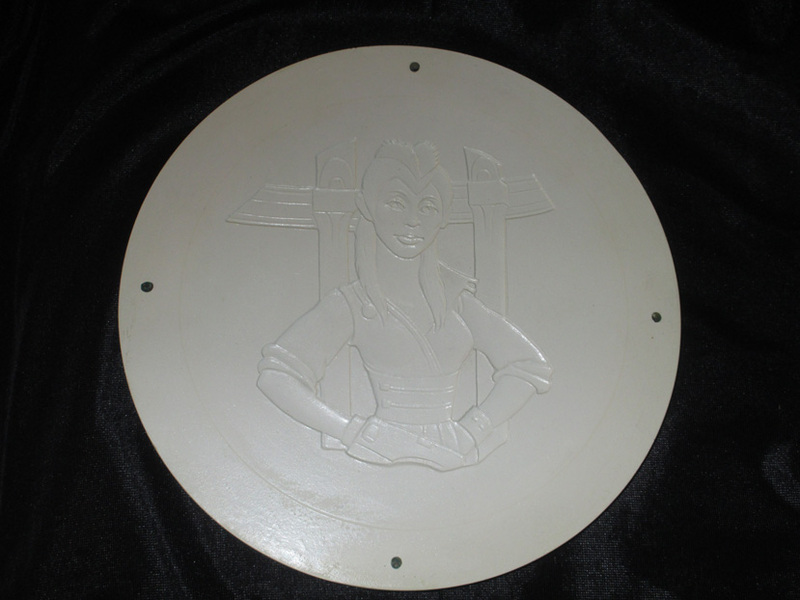 An example of a coin sculpt can be seen here. This is the first (and only) major step of the Kea Moll production process entirely missing from our rundown. Sadly, the sculpt for the coin has never turned up and was almost certainly destroyed. 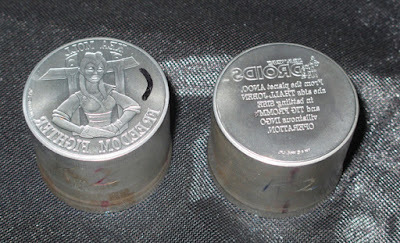 Kenner used two mints to produce their coins and each had slightly different production processes. We will only be concerned with the mint that produced the Kea Moll coin (a company called Osborne Coinage), which also produced about half of the other characters’ coins as well. In order to get the desired look for the final coin, Kenner needed a negative copy of the sculpt (the details sit into it rather than being 3D) with a slightly domed shape to its surface. Getting to that point takes a couple of intermediate steps. It should be noted however, that only Osborne coins needed to have a domed shape, because that's the way they did things. The other mint (Worldwide Mint) had flat surfaces to their tooling masters. The first step towards our goal is to create a negative copy of the sculpt out of white epoxy and a green resin called “dynacast.” Also at the 6-to-1 scale (about 9” across), the details on the Stage 1 hardcopy are set into the surface, rather than rising above it like on the sculpt. The next step is to create a soft rubber copy of the Stage 1 hardcopy, only in the positive, meaning the image is 3D, just like the production coin. The entire purpose of the softcopy is to bridge the gap between the original sculpt (convex image where the details rise above the surface) and the Stage 2 hardcopy (concave image where the details sink below the surface). Additionally, there needed to be a slightly bulbous quality to the surface, rather than being completely level. Since the softcopy was done in pliable silicon, it could be bent without distorting the image and was perfect for the job. Kea Moll Stage 2 Hardcopy Coin, the "Tooling Master"
Since the softcopy could be bent inward slightly while it was copied in resin and epoxy, the resulting Stage 2 hardcopy was slightly domed outward. This was what they were after the whole time: a negative image hard enough to survive the tooling process, and possessing a domed surface. Thus, they were ready to use it as a tooling master to create the final steel die for the coin. The Stage 2 hardcopy tooling master has no text however, which would have to be added to the production dies using an etching. The etching is done on a thin sheet of zinc, with the image and text of the original coin rendering literally being burned into the surface of the zinc with acid and a photosensitive material, at roughly 2.5 times the scale of the production coin. The purpose of the etching plate is to essentially serve as the sculpt of the text, so that the words appear clean and easy to read on the final coin. The image of Kea on the plate didn’t matter, which is why it differs slightly from the image on the production coin. All that mattered was the text. The image is almost certainly a copy of the original art for the coin though, so it's interesting to see. Etching plates of the front and back of the coin would have originally been created, but the back plate of Kea’s coin was recycled for use on a different coin for the unproduced second series of Droids figures. Her back plate was altered and the original text lost or obscured as a different character’s text was glued down over top of it. For informational purposes, it is this stage where the difference in techniques employed by the two mints which produced the coins becomes most apparent. Osborne (the mint which produced the Kea Moll coin) used these zinc etchings to add the text to the steel die, while Worldwide Mint (the other company), used a material called "Dycril." Dycrils are made using a photo-chemical process, where the art/redering is projected onto the material and the image is transferred because the light chemically changes the composition of the Dycril. Dycrils are larger than these zinc text masters and made of a different material (obviously). But Osborne never used Dycrils and Worldwide never used zinc text masters. They are two different companies, using different means to accomplish the same goal: adding text to the steel dies. Since no Dycrils of Kea Moll's coin were ever made though, they don't concern us at the moment. 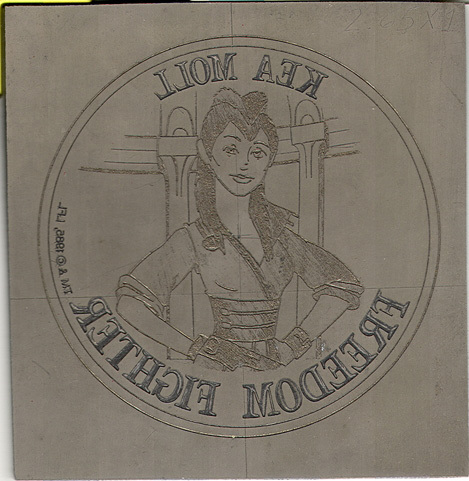 Once the mint had the tooling master for the image on the coin and the etching plate for the text, they could combine them and cut those details into the steel dies. The actual process was done using a pantograph, a machine that traces details on something using one stylus and replicates those details at a different scale onto something else. All of the details of the Stage 2 hardcopy coin and the text on the etching plate were traced and reproduced onto the blank coin dies, creating the means to produce the final coins. You might recognize that this process (sculpt leads to hardcopy which leads to steel mold) is the same basic one used on the action figure. 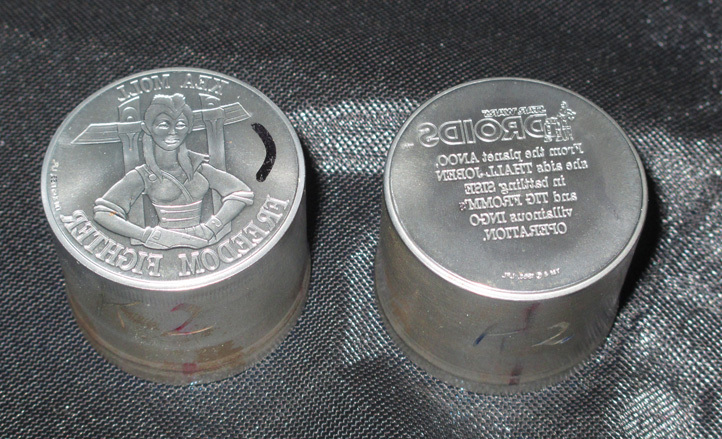 The details of the action figure’s hardcopy were traced by a pantograph to create the tooling aid, and thus the steel mold, in much the same way the Stage 2 hardcopy coin was traced to create the steel dies. In fact, the Stage 2 hardcopy coin is the tooling aid stage, which went unseen in the 3 3/4" production process. Although the process seems overly complicated, it’s actually still the way a great number of everyday products are created. Since these dies are solid steel, there was really no risk of them wearing out from stamping the soft aluminum of the production Kea Moll coins. As such, these dies are the only ones which were created to produce all the Kea Moll coins ever released in the world. If you’ve ever seen or owned a Kea Moll coin, it was created right there. The die strikes the coin blanks, and the aluminum is pressed into the die cavity, recreating the image of Kea Moll in the positive. The resulting coin was then inspected to make sure it conformed to the design specifications required. The first shot coins are silver, rather than gold, because they haven’t gotten to that step yet. They’re simply tests. 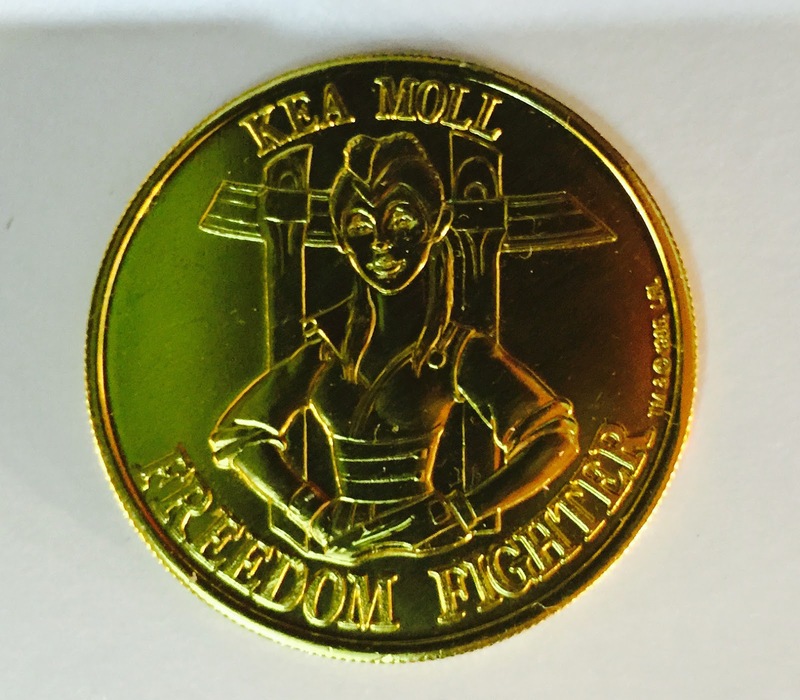 At this point, the coin vendor would have sent back some samples of the Kea Moll coin to Kenner, to get their approval on the coin. Although no Kea Moll coin QC samples have ever shown up, an awesome C-3PO example can be seen here. Finally, the coins were anodized so that they were gold in color and the coin production process was finished. The coin mint would then start shipping the finished coins to the vendor producing the action figures for Kenner, so that the coins could be included in the packaging with the figure. The last step in the production process is for the vendor (the factory in Asia actually manufacturing the toy) to send a sample of the assembled and packaged figure back to Kenner for approval. The company would examine all aspects of the figure, cardback and coin to decide whether or not it met their specifications. If approved, production would start. If it wasn’t approved, the vendor would need to make the necessary changes. This would be a continuing process over the course of the line, where the vendor would supply samples of their work every so often to Kenner for inspection. 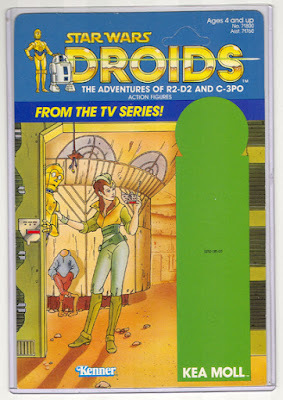 You’ll notice that this particular QC sample is on the Canadian version of the Droids cardback rather than the domestic release we’ve been following. It should be remembered that the Canadian version went through its own package design process just like the US version did however, adding to the incredible amount of work that went into getting the Kea Moll figure to market. 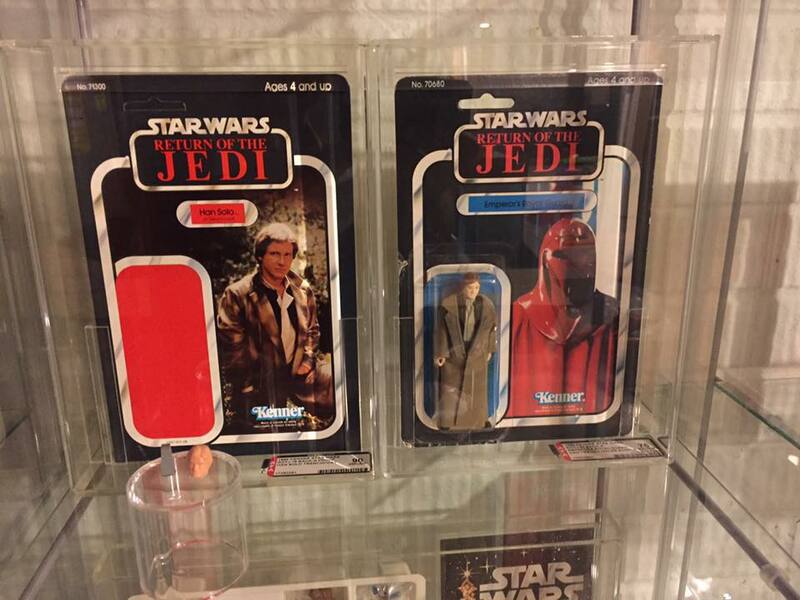 Ironically however, the same factory was producing the final carded figures for both the US and Canadian releases. As far as I know, no QC samples from the US release of any Droids figure have ever been found. The number of QC samples of the Canadian release can be counted on one hand, but surprisingly (or perhaps unsurprisingly after all we’ve seen by now) Kea Moll was one of them. 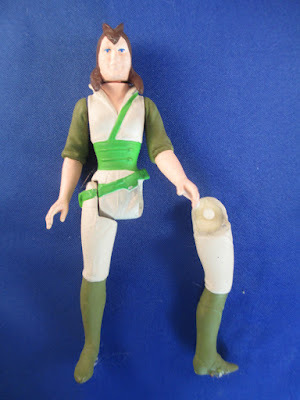 Kenner could now begin shipping the finished Kea Moll action figures to stores. ...the discount bin. Because kids just didn't want to play with a Kea Moll figure. All of that hard work. Thousands of man hours, utilizing the talents of hundreds of artists, in several countries. Stages done in wax, plaster, film, resin, silicon, clay, ink, paint, pencil, rubber, zinc, paper, acetate sheets, cardboard, plastic, and solid steel. 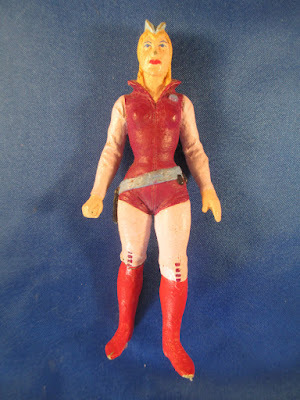 Just for a .50 cent Kea Moll action figure that the entire world ignored. Kind of puts it all into perspective, doesn't it? There's a Pixar movie in there somewhere. Toys are complicated. And they're hard work. But I think they've become so ubiquitous in our society that we sometimes overlook that. We dismiss them. We forget about all the effort that went into creating them and instead imagine them somehow materializing fully-formed on store shelves. They are sometimes designed so well, we forget they are designed at all. And that's a shame, because I think they're art. And all art is worthy of respect. Even if it's of a character no one has ever heard of, and it only costs 50 cents. 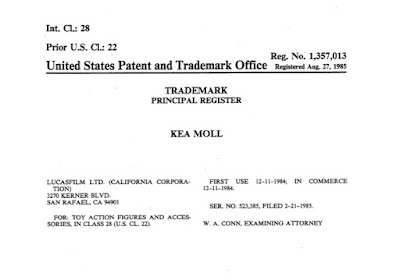 Copy of LFL's trademark to Kea Moll's name in regards to toys, which was filed about a month and half after the coin tooling master was created. If you would like to learn more about how these toys were created, I HIGHLY suggest picking up copies of (Coining a Galaxy, Gus and Duncan's Guide to Star Wars Prototypes, and A New Proof). If you are interested in the story of the interrelationship between the Star Wars films and the toys they spawned, I'd recommend Steve Sansweet's From Concept to Screen to Collectible. If you decide to start collecting this type of thing, you need to educate yourself first. Learn how the process worked and what the stages looked like, and spotting fakes will be much easier. If you don’t know, ask someone who does. There are any number of trustworthy experts in this hobby who understand this stuff, and they will be more than happy to give you advice if you ask them. Contact them on Facebook or one of the collecting forums if you have questions. You'll be glad you did. The time to spot fakes is before you buy them. Thanks goes to Ron Salvatore, for helping me by fact-checking this article and making suggestions for improvement. Collecting is always a learning process, and the day I know everything about this hobby, is the day I'd grow bored. Yehuda Kleinman, for helping with the coin photo. And to Steve Danley, who actually proofs and re-formats every SWCA blog entry, not just this one. Special thanks goes to Kim Simmons, who was the photographer responsible for taking the vast majority of Kenner's Star Wars photos, including a couple seen in this article. He still sells prints of his work and you should definitely check out his site: The Man Who Shot Luke Skywalker. 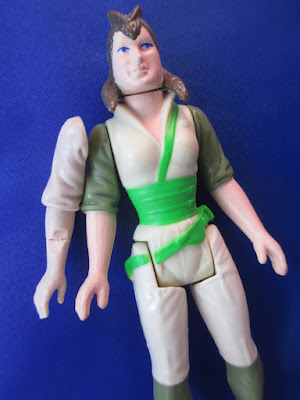 If you’d like to see a similar rundown of the production process employed on the modern Star Wars line or the Micro Machines line, please feel free to petition Hasbro to manufacture a modern Kea Moll figure. The same goes for movie props or how the Star Wars: Rebels show is done. Kea can guide us through anything, I'm sure. Everyone needs to write to the producers and demand more Kea Moll, in all aspects of the Star Wars fandom. TV shows, movies, everything. The world needs Kea Moll, now more than ever. I’m even willing to be an expert consultant on the character, for her new appearances. Your move, Dave Filoni and J.J. Abrams. Your move. Make your voices heard, fellow Moll-Rats.